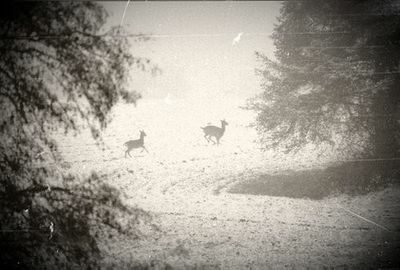 catching a glimpse of deer gracefully prancing across a snow-covered meadow…. In the Meadow captures all of this and more. This collection of images was inspired by the snowdrifts that gathered in a meadow near the house where I grew up and all of the fun we had outdoors during the winter months. I imagined reindeer with freshly made footprints in the snow, a ride through snow-covered hills in a sleigh, children sledding and more. The dies included in for this collection allow you to layer the images on top of the snowdrifts and an amazing number of other design opportunities. In the Meadow will be available for sale on October 15th. A coordinating set of dies will be available for sale separately, retailing for $14. The collection contains a total of five dies: 2-3/4" x 2-1/2" (A), 2-1/4" x 3-1/2" (B), 1-3/4" x 1" (C), 1-1/2" x 1-3/4" (D), 3-1/2" x 1-1/2" (E). I also designed a separate set of dies that can be used to represent the rolling snowdrifts of a meadow. These dies will give you perfectly smooth curves every time, out of both paper and felt. Try edging them with glitter for spectacular results. You can even create them in shades of green to represent rolling green hills. The In the Meadow die collection will be available for sale on October 15th. 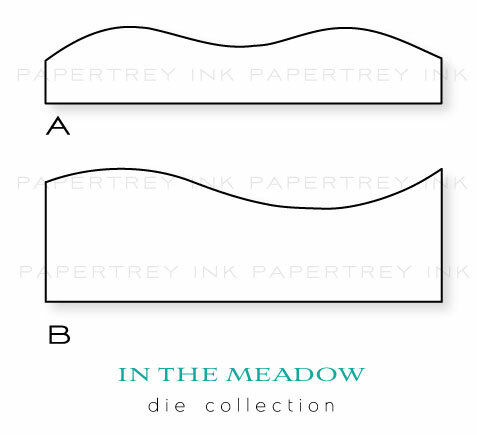 The In the Meadow die collection is a set of two dies. Snowdrift A measures 5-1/2" x 1". Snowdrift B measures 5-1/2" x 1-3/4". The two dies layer perfectly on top of one another. I have one more additional die to introduce to you today and it is the perfect solution for creating special packaging for the holidays and throughout the year. The intent of this die is to cut two of them from your selected cardstock color and adhere them to the front & back of a trimmed down lunch bag. You will get professional results and be able to create large & roomy gift bags for any occasion for just a few cents. The Front & Center #1 die will be available on October 15th. The Front & Center die measures 5-3/4" x 7-1/4". I thought I would start things off with a gift bag I created using the new Front & Center #1 die. I die-cut two pieces of Spring Rain cardstock with the Front & Center #1 die and decorated one of them to serve as the front of my finished bag. It is important to get all of your decorating done first before you adhere the bag together.. I used lots of fun little details to adorn the front. I die-cut the In the Meadow snowdrift dies from Vellum Cardstock. I stamped the smaller one with Background Basics: Text Style and the larger one with Polka Dot Basics II, both using Fresh Snow ink. I heat set the ink after I was done stamping to speed up the drying time on the vellum. The boy sledding was die-cut from Soft Stone cardstock to provide a bit of contrast with the white embossing of the coordinating image. I die-cut the trees from Spring Moss cardstock and then ran them back through with the Woodgrain Impression plate. The sentiment was heat embossed with White Filigree Embossing Powder directly onto the bag front. 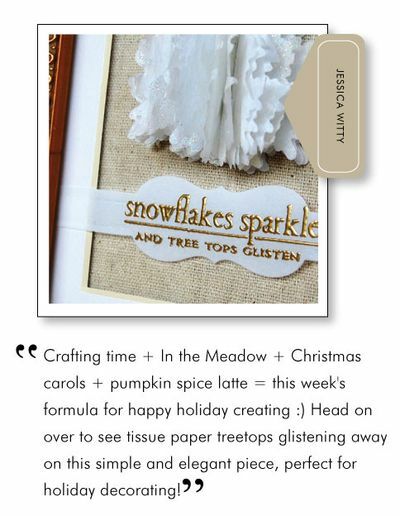 I stamped snowflakes from In the Meadow using VersaMark ink all over the top portion. Look at the detail of the handles…I just love all those scallops! After my bag front was complete, I adhered everything together with Scor-tape. 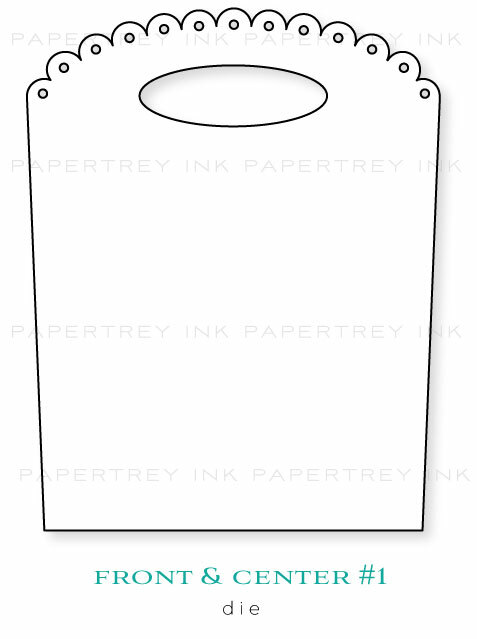 I used an ordinary white lunch bag, cut down to 5-1/4" tall, between the front & back panels. All in all with the lunch bag and the two pieces of cardstock it took to cut the front & back panels the bag costs a mere 45-cents! You just can't beat that! Especially if you want to make several coordinating specialty bags for party favors or other mass-production! And they are so roomy, they can hold fairly large items! Next I thought I would share a card with you. I die-cut the In the Meadow snowdrifts from vintage bookprint from an old book and used Tea Dye Duo on the upper edges. I die-cut Vintage Cream cardstock with the horse & sleigh die and stamped the coordinating image in True Black ink. I stamped the sunburst image from Nativity Silhouettes in the background with True Black ink as well. The trees were die-cut from True Black cardstock and cut down to shorter sizes. You have until 7am, Friday, October 14th to leave your comment and be eligible to win. Only one comment per person please. One randomly selected winner will be announced by noon the same day on our October 2011 Release Winners page. Thank you for stopping by today and best of luck with the contest! Maile Belles has some amazing projects today using both of her new dies. FINISHED SIZE: 5-3/4" x 7-1/4"
What a wonderful collection of vintage inspired images! I can see using these for gift tags, cards, and home decor. I am constantly amazed by the new designs you come up with! Great job to all! Such a fun vintage look! And that Bag Die — just so clever and just in time for the holidays! I love the new dies!! All of them are awesome! Can’t wait for the 15th. Always amazing, top notch products. Thank you for continuing to inspire me every month!! I’m in so much trouble this month. I want it all! Ooh, those front and center dies look so neat! It will be fun to try them for all sorts of holidays! LOVE, LOVE, LOVE! What inspiring examples! The results of using these awesome dies is that they add more dimension which makes the card stand out even more. 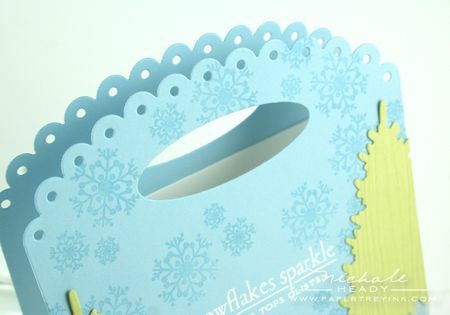 The Front and Center dies make lovely snowy hills and the silhouette dies can be used for more than just Christmas cards! Can I just say—pure gorgeousness (is that even a word??? LOL!) Just more pretties to add to my ever growing shopping list!! Great vintage images! Love all the new dies and can’t wait to get my hands on them! The 15th can’t come soon enough! These are really pretty! The front and center die is so unique, I love the bag you created. Love the look of the new dies! It is truly different from any other products on the market. Thanks for all of the holiday inspiration- I can’t wait to make christmas cards for everyone in our family! Those Meadow Silhouettes dies are great! Is there any scent you can’t produce with them?? This entire release has been amazing, but In the Meadow is just so much more beautiful than I ever could have imagined! These images bring back so many wonderful memories of holidays past, and I love them! Love them! The vintage images are so unique and all the dies are fantastic. The lunch bag die has so many possibilities. Love all the projects. Simply stunning! I think my favorite image is the sleigh ride; it reminds me of winter traditions of long ago! Also, the gift bag die is fab. Can’t wait to make packages for only a few cents. The vintage silhouettes are unusual and creative, and the gals did a fantastic job of using them! This set is just *beautiful*. And so versatile… it reminds me of something from times gone by, but it could also work so well with something much more graphic and contemporary. Stunning. Absolutely amazing. I had no idea that this would be such a gorgeous set. I love it, I can’t wait for the release and the projects are over the top. Wow!!! Just BEAUTIFUL… this looks like such a versatile set – it reminds me of times gone by, but it would also work so well to create something more contemporary. Stunning. Oh my heavens, I want it all. the Meadow sleigh reminds me of my Mom’s dream of us all arriving at her house in the country by sleigh in the snow. Although, we have never been able to do this it is still her dream. Now maybe I can at least make her dream in a card or decoration. I have to throw my whole budget out the window!!! These dies and stamps are my absolute favorite!!! Makes me think of being home for the holidays!!! Thanks for all the amazing inspiration! I LOVE this new set and the new dies!!! Love the scenes you can create with this set! The set and dies are stunning! Love what the DT created with them! You’re killing me with the horses and sleigh! I adore that image and will have to have it. The Front & Center die is intriguing, too. I am simply blown away! Not really ready for the Christmas season yet, but you’re certainly helping to get me in the spirit!! The in the meadow set is stunning! It’s so “au courant” with today’s styles and yet so completely reminds me of an old time, idyllic Christmas. Wow! You all seriously never cease to amaze me. I can’t believe the super fun, creative, original products you come up with! That’s why PTI is my absolute favorite stamp company – and not just because of the stamps! Honestly, I’m amazed by the whole line up this month, but this In The Meadow is just a hit right out of the ball park. Just fabulous. 😉 Love it! WOW! This is far and away the most astoundingly creative set I have ever encountered. In the Meadow is an INCREDIBLE set! I love all the DTs’ samples and projects too. Wow… you are all so very talented. I love the new dies and all the projects are simply stunning. This set is so wonderful. It reminds me of the holiday season I read about in books–since I am in Southern California. All the images are so classic. I knew that I would like In the Meadow because I love classic images and what’s more classic than silhouettes. I didn’t know how much I would love it though. I must say In the Meadow is definitely a “WOW” set for me. I’m lovin’ all the DT projects as usual. All I can say is that I am in love with everything that has been shown tonight. The dies, the stamps, just everything! Oh my goodness! These dies and stamps are exceptional! I just love the vintage feel and that wee one on the sled just has me grinning from ear to ear. Thanks for the continued inspiration! I knew this set would be going in my cart just from the sneak peek alone. Love, love, love it and the coordinating dies – swoon, and the snowdrift dies – double swoon. It’s a trifecta of winter wonderland goodness. Is it midnight on the 14th yet? Oh, I am having trouble finding the words to describe how much I love everything you previewed today! Such fabulous and clever products and all the samples are stunningly beautiful. Today’s posts once again prove that PTI’s designers and DT are creative masterminds! I’m in love with In The Meadow. What an amazing set. And all those dies…wow! This is another great release. wow, what a great group of projects!!! knocked it out of the park!! Oh I am in love! I love all the little woodland creatures in this set (and they can be used all year long). I also have a soft-spot for sleigh rides (even though I’ve never been) – they just represent winter for me. A definite must-have for me! I really love the new snowflakes! Truly innovative! Such an impressive release. Wow! What a great concept! I love all of the design team’s creations. I think all of the goodies from tonight’s post alone will blow my budget this month. Thanks for the chance to win! What beautiful projects! Loving all of the dies and created scenes! I was not expecting In the Meadow to WOW me so much! I should have known better. Simply Stunning!!!! Well, what can I say besides YIKES!!!!!!!!! I love it all. The dies and stamp set is glorious. I loved how Betsy showed the versatility of dies and don’t just have to use for cards. Great job! Makes me think of what I could do with other dies and such I could make. Love the framed images. What an amazing set! Vintage is my favorite style to work with right now and these images/dies are just what I’m looking for. This set is perfectly dreamy! Everything I could ever wish for in a vintage sleigh set! It all looks like so much fun to create with-love it all! WOW! So many dies to go with all those cute images! I am love, love loving this set and the dies! They’re perfect and timeless and I can’t wait to see all of the sentiments… the theme is amazing! TFS! Owh please if I was to win one set let it be this one!! There is not one month that goes by that I don’t use “genius” in a comment on your blog. This is the one! I love every little bit about today’s introductions. And I’m a sucker for a squirrel..ha! Every bit of it is gorgeous! 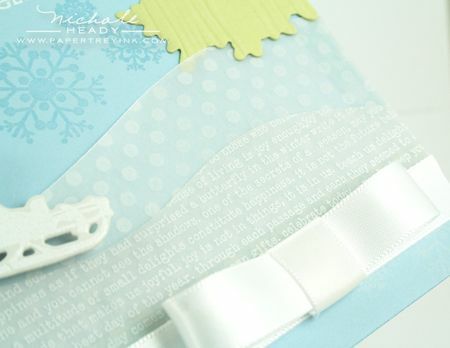 Love that you can die cut perfect rolling hills or snow drifts! My favorite set & dies yet! What a great job! Beautiful cards and bags! I love the die for the front of bags—-such a wonderful idea! Oh those dies …. to die for. Love this concept of vintage images and yet so versatile – like being home for christmas. *sigh* I just can’t decide …. Absolutely blown away by these amazing projects. Love all these dies. So cute and pretty! love all this new set! I am in LOVE with this set- and MATCHING dies!! woohoo!!!! All the die cuts are awesome! This is a truly wonderful set with a nostalgic feel. Amazing cards and projects by the design team. Guess I’ll be placing another order from Canada! What an incredible set and dies! While looking at the today’s post, without even realizing it, I started singing a Christmas song to my baby! 🙂 I’d say this set definitely puts me in the Christmas spirit. It makes me happy and ready for the holidays to start. Love it. Oh, and the front & center die is awesome. I can definitely think of tons of uses for it. Love all the die sets – it makes using these sets so easy and creates very classy cards – love them! The Front and Center die is fantastic! What a great idea! love the in the meadow die too! And what the rest of your DT has come up with…oh my! Great release PTI!!! Awesome! I thought my favorite w as going to be the rolling hills die because of the versatility, but I think I like the Front & Center die even more!I do love the musical background on Nichole’s card because you can’t just SAY “Dashing through the snow,” you have to SING it! I love the images in In The Meadow – what a perfect pairing of images and dies! The Front & Center die concept is simple and innovative at the same time. PTI customers can now have bigger favor bags and still use their Big Shots and Cuttlebugs. I’m looking forward to more of these dies! Lovely! Love the new sets and the dies for the bags. Perfect for Christmas! Funnily enough I’ve been having the same kind of ideas for a stamp set like this one… I love all the dies. Wow, this day is full of amazing details…wonderful stamps and dies…can hardly wait to see more! The vintage stamps in the “In the Meadow” set remind me of my father telling how he could sled from the top of a hill in his town all the way down to the river blocks away. I was on that street last night and thought of his story and today I realize there is a beautiful stamp set waiting for me to buy. Thanks PTI! What a great bag die and I’m loving the sledding stamp/die cut! I recently moved back to sunny California and didn’t think I would miss the snow of the east coast and the midwest, where we just were. Now, I know I was wrong — is it possible to be nostalgic for something that you just left? Yep, it definitely is! Oh I do love the vintage look! I may have to take the plunge and start investing in dies! I would LOVE to win these, everyone’s projects were so beautiful today – I love the snow drift and Christmas tree die and the Meadow stamps are so nice too. The bag is a great Christmas idea too! Oh my gosh, this is the BEST prize list ever. I want to win this, and I truly think it’s my turn. The In The Meadow set and dies is so right on with getting in the holiday spirit and reminiscent of my childhood. Also love the sentiments I’ve seen so far. So glad I was undecided about what to use for my holiday cards this year ~ you just came through in a BIG way. WTG…again! I love the snowman and the sledder and…all of it. And such amazing work on our designs! Thanks for the inspiration! Love this months re;ease dies collections. Perfect to get me ready to start my holiday projects. I have so many ideas in mind already. They are just amazing. I adore that sledding image! Totally brings back great memories of going down the hill after Sunday School (in our Sunday best)! I love silhouette images and this set is just lovely! The bag front die looks pretty cool as well! Love the idea! So many great ways to package things up for Xmas this year with all the fun dies! This is the best stamp set and coordinating set of dies you have created yet (IMHO)!!! The images are beautiful and timeless. The sense of fun, joy and beauty are all conveyed so well I am amazed and obviously pleased. Well done!! What fun to have such a set that is so different from anything I have in my collection! And the dies just make it all the more appealing. I also love the Front and Center dies. What a great idea! This set and all the dies are awesome. So classic and elegant and more versatile than just for holiday projects. Love! This is my absolute favorite for this month!! Beautifully done Nichole! Love all the new dies coming out too. Can’t wait to get them all. Wow! I love these stamps and dies. What fun! All I can say is WOW!!! Love all of the new dies! Oh, wow! Those new dies are amazing. And I love the gift bag idea – so many possibilities for packaging there. I really do dream of a white Christmas like these images- in Oz I don’t think it is going to happen! The dies produce amazing shapes though, and the gift bag idea is brilliant. What wonderful new dies and stamps and I love the giftbag and the card. Wow, these stamps/dies are stunning! And inspired by one of my favorite Christmas songs! I love snow! You all never cease to amaze me with your wonderful creativity. I love this set! The lovely silhouettes remind me of an old fashioned Christmas. I love A Christmas Carol and these stamps so remind me of it. I also love that there are coordinating dies that can be used with the stamps or by themselves. The sentiments are great too. This is a must have set. You now have my complete attention! 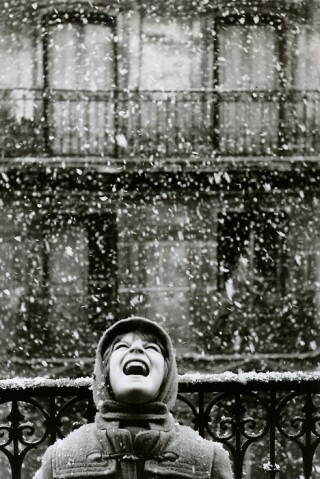 A little boy on a sled, the PERFECT snow flakes and silhouette dies. I also so love the gift bag die. I can’t wait to customize some of my own gift bags. And what a fun way to wrap a set of cards for gift-giving. Gorgeous set & love,love,love those “snow drift” dies – how many times have my attempts to hand cut gently rolling hills for a card-scene ended up in frustration…never again thanks to PTI! What fabulous vintage dies, stamps & inspirations! You’ve created a winter wonderland!! Love it all! Gosh this is an absolutely gorgeous release!! Fabulous projects shown. Just LOVE this set! How nice! The dies are really pretty! The front and center die is so unique, and I think I will produce a lot of bags this christmas. These stamps and dies are perfectly wonderful! Love the vintage look and feel that you captured so perfectly! Oh Nichole, you AMAZE me! This set is lovely! I would be so excited to win this package! Jaw-dropping wonderful stamps, dies & projects! W.O.W! Love EVERYTHING today – nothing more to say really! WOW, this is by far the best Christmas set i have ever seen. It is so close to what I think of christmas. It is really perfect. It also brings back lots of memories. I just can’t wait to order this set. Thank you Nicole. The design team has done a marvelous job in presenting this set, such inspiration, love Jess’s sparkling tree. Love the paper bag die also, a must have. No way…. sigh…. after seeing the previews a couple of days ago, I seriously thought I would be able to resist this set. But I was so wrong!! The stamps and dies are so beautiful!! You’ve all made such a gorgeous projects and inspired me so much, I wish I could start playing right away…. Such beautiful images, makes me actually look forward to winter (for a minute anyway!) Love the die for the bag too, can’t wait to use it! PTI continues to amaze me with their creativity!!! I would love, love, love to make so many cards and gift bags with this new set!! The set and dies are now moved to the top of my wish list!!! Can’t wait to get my hands on these!! All the girls projects are just stunning! Love the beautiful new stamps and clever dies!! I have my fingers crossed hard this time!!! I love the new front and center die. I was just wishing for a way to create larger gift bags and just like that you have just filled a need. Thanks! These are amazing! The Front and Center die is such a great concept, especially love the edging of it. Can’t wait to see all of these sets and dies. In the Meadow is absolutely stunning and completely timeless!! I’m guessing by the name we’ll have more bag dies – how exciting!! Love all the amazing and one of a kind ideas you have every release! Love your creations! Can’t wait to get these dies! This is so amazing LOVE in the Meadow..so sorry for myself I made my order last release and are only able to order in feb. next year…love this set and all the images so much!All the projects from you and the team are so beautiful! I can’t tell you how perfect this set is!!! It embodies everything I love about PTI!! 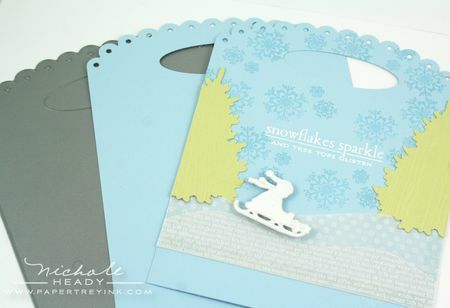 Love ALL those marvelous dies, esp the versatile snowbanks, as well as the new Front & Center series! Swooning over here! Well, here we have it! The most PERFECT Christmas set for me – everything I love about an old fashioned family Christmas. And here in the UK we’ve been having more white Christmases lately – just like I remember from my childhood – though that might just have been a dream!!! I would buy this set for the sentiments alone – especially that birthday one. We have five December birthdays in the family and I can’t wait to make the perfect birthday cards for all this year. Oh what a wonderful set! My fingers are itching to create something Christmasy with it!! =) Beautiful silhouettes.And the projects the DT made – nothing short of amazing. THanks for all the inspiration. That’s why I love PTI so much. Oh my! There is nothing in today’s post I don’t love! Love the silhouette set and matching dies! It’s so different than any of the other sets I currently own. This. is. amazing!! Love, love, love the In the Meadow and dies!!! I can hear the snow falling and the kids laughing and the muffled clip clop of the horses hooves as he pulls the sleigh!!!!!! As Cath would say, Oh My Moxie fab!!!!!!!!!! The Meadow stamp set is wonderful. So inspirational and I just have to have the new Front and Centre die is amazing. Just have to have the lot! Every year my brother hitches his Clydesdale to the sleigh, and we actually go riding “in a one horse open sleigh”. It is so much fun, and this set will be great for depicting those memories. Love the dies, too! Today’s post is amazing! The stamps, dies, and that gift bag die is too much! Christmas is coming very early to my house this month. Today is the perfect day. I love every bit of all of the new items listed here. Thanks for another great month! What beautiful cards! I love all the dies which will make creating gorgeous scenes a whizz! When I first saw the peek of this set I didn’t think it would be my style, but …. after seeing all the design team samples I love it! The sentiments are perfect for so many other projects too! Oh, My Gosh!! I absolutely love everything this month (oh, who am I kidding….every month!). PTI makes me look like an absolute genius with all these stunning products to use. Thank you many times over for such joy and inspiration I receive from the DT and inspiring, innovative products that PTI keeps putting out!! I love the products previewed today and the cards are beautiful. It’s going to be hard keeping my order under a $100 this month. Front & Center will be in my cart along side the gift card die. These images are certain to never go out of style; they are classics. It is nice to see a nice selection of dies to choose from that coordinate. LOVE! The new front and center die looks to be such a fun way to decorate a plain old lunchsack! Thank you!! I am so thoroughly inspired and excited by this reveal!!! I knew from the sneak peek it would be awesome, but what you’ve all done with it is nothing short of amazing! I can’t wait to play around with this set and the dies! The projects the Design Team has created using “In the Meadow” stamps and dies are absolutely amazing! The cards should be framed as works of art! Wow! This is the best yet! 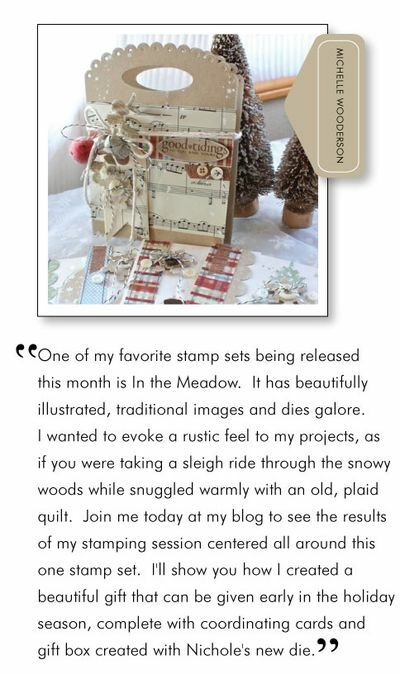 Love the In the Meadow set with coordinating dies AND the Front & Center #1 die! Thanks! This set reminds me of my childhood. Thanks for the beautiful product and the memories. I feel like a broken record because I keep saying……”Oh, WOW!” for every reveal….LOL Today’s post is just amazing and what the whole team has shown us has my head ready to explode. Love, love, love the silhouettes!!! They are stealing show today, Nichole!!! Oh, gosh! And I thought I had finished my wishlist, ha ha ha!! Well, ho ho ho, not anymore!!! ;-D These are gorgeous, Nichole, and you and the design team have made me fall in love with these! True christmas & winter perfection!!! These are fabulous! I love what everyone did with the product! Front & Center is a perfect addition to any stamp room! So awesome to make giftbags~! Absolutely brought back sweet memories of going sledding @ first snowfall each winter. Stunning new set and where is that ‘I want it all!’ button? I can’t get this set in my hands fast enough!! I love it, everything is so beautiful. Love it all. Everyone’s creations are just fabulous. Love the new front & center die. What a great idea for making ordinary lunch sacks look so wonderful. Love love love the snow die for making the hills! Great set! This is the post I have been waiting for! I love the classic holiday silhouette images & sentiments and that the designs can be used throughout the winter, not just for the holidays!!! Absolutely stunning designs by the entire DT! Another amazing die collection being introduced this month!! Oh my goodness! Jaw-dropping gorgeous! You are a genius. This set is beautiful, Nichole! I am totally smitten with all the PTI dies and you have won my heart again. I MUST have the front and center dies—I really love all of your packaging options! I love the nature images of winter. This set has hit the number one spot on my shopping list. What a beautiful classic set! WOW. I love those dies. I am really going to have to break my budget with this month’s release. Love them all. This set is so cute! Great dies to match, also. Love these! Love the panel die for the gift bags. . .so cute! I love all the vintagey goodness of those silhouettes! Gorgeous samples by the team! I can see me using that bag tag die a lot!! I’m just absolutely giddy!! I am sooooo in LOVE with set and everything that goes with it! What an amazing job the DT did showcasing it. I am absolutely in love with this set and the dies! This is just gorgeous and an absolute must have!! Gorgeous vintage images! Love, love the front and center dies, so many ideas for gift packaging!! Love, love, love the deer! How useful they will be for guy cards throughout the year. And the front and center die?SWOON!!! Be still my heart! The snow drift dies… what a clever idea! All the snow drifts I’ve ever made didn’t come together so well. These are perfect! WOW! I should just throw out my monthly budget now. I want everything. In the Meadow just makes me wish I lived somewhere with a white Christmas. It’s so evocative of the cold and wintery scenery. By the time I was half way through the DT projects, I was a goner! This set is fabulous and I already have a long list of winter birthday cards planned in my mind! Just Fabulous!!! Oh wow! I love the vintage look of these wonderful silhouettes! This will be a great set to make Christmas cards and gift bags with – that lunch bag front die is such a cool idea! I love the scallopy handles! I really love the look of this set, and the dies look like a perfect match! I’m a sucker for vintage holiday images, and the sentiments are fun and unique — what a great combination!! Love this new set of stamps/dies! I really like to have stamps that refer to songs/verses. All of this inspiration almost puts me in the mood for colder weather! Great new stuff! The In The Meadow series is so charming! It is the perfect mix of vintage and clean lines and would make lovely tags or ornaments in addition to cards. And the Front & Center die is brilliant! Since it is #1, I am guessing there are more to come and can’t wait! Wow. The images in this set are amazing. I am partial to that little cardinal. It made me smile this gloomy morning. Thanks. Well I guess I’ll be making up for not buying anything last month! Actually maybe three months worth. I LOVE vintage silhouettes, and this set is so perfect! All the projects are just wonderful! Oh my! This is SO beautiful!! So classic and classy, yeah PTI!!! What a stunning set of stamps–I love them all–and the coordinating dies are the cherry on the top. Amazing products and projects!! The Front & Centre die is such a fantastic idea!!! I love vintage and the silhouettes are so great. What a widevariety of cards, tags and home decor for the holidays! Great set & dies. And I love, love, love the die for making gift bags. Oh wow – I don’t even know where to start. You all give so much inspiration. What can I say, simply gorgeous! I love the new stamp set and all the new dies that go with it. The die for the gift bags is fabulous! Can’t wait for the 15th! Oh how fun! Love all the creative ideas with these goodies! Thanks for sharing! Oh my goodness!! I want it all!!!! The front & centre die is very neat! This set is so very unexpected and I am really liking it! Gosh this set reminds me of all the wonderful old Christmas Films that I love to watch again and again each Christmas. Fabulous samples and I love the gift bag idea. In the meadow is so versatile. As much as I dislike snow, I say. Bring it on. OMG–I wish I had indisposable income so I could get the “I want it all package” this month. I’m loving everything that’s coming out! I can’t get those christmas songs out of my head now and it’s October! Wonderful Christmas images – bring on the snow! Love the Front & Center die! And you have created an amazing ensemble for winter. I will be so much fun to create with these set – I can’t help but sing Christmas carols in my head while looking at them! oh,my! in the meadow is one beauitful set of stamps and dies!!! love the idea of it. and the rolling hills dies….way cool! beautiful samples, as always! Love the gift bag die! Very elegant looking and much easier than trying to cut it out by hand. Love the vintage feel to this set! Looks like it’ll be great for making projects for grown ups and kids alike! These are all so beautiful. It makes me want to play in some snow! I love the look of a silhouette! And a die to match them? So exciting! Love all the projects made with these! Such a pretty set… living in New England… I can never have too many SNOW type stamps… great images! Wow, I am in love with this stunning set and die collection. And the Front and Centre die is ingenious! So many uses come to mind, I just love how versatile your products can be. Thank you so much for the continued inspiration! oh my….I just love the traditional look and feel of the new images and dies! so many possibilities for the new lunch bag die! One word…WOW! Love the new set and dies! Oh, such wonderful new stamps and dies! I think the silhouettes are my favorite! The DT and you have done such wonderful things with them. OMG I LOVE this new set with dies! I have to have them!!! Oh my, these are my very favorite products ever. Can’t wait to see it all. Your projects are the best…love bothe the bag and card!! Tfs and now off to check out the team. Each and every project today was so beautiful. This is definitely a fun and unique winter set! I will probably be humming Christmas tunes all day now! Well this just is the icing on the cake of love! I LOVE this vintage look set and dies!!!! My favorite so far. Great work in coming up with this. This just might be my favorite yet! Oh my what a fantastic package of gorgeous images and fantastic dies. Love your examples Nichole just stunning! I just love the feeling of this new set, it is so nice to have the charm of years ago. Thanks for all the inspiration from the wonderful designers. Fun vintage look to the new dies. They are great. The new dies and stamp set are so beautiful. I love the gift bag die, so clever! Thanks for the chance to win! I can’t wait to get the In the meadow set and dies!! oooo and that front and center die!!! I love the front and center die! I have a ton of lunch bags I could use up! I have to agree with several of the designers. The snowman is very cute and can be used for so many things. The die for transforming lunch bags is a great way to make beautiful teacher gifts. I love that you can take just the dies and make silhouettes of everything! I didn’t think I wanted this set before, but after I have seen all of this wonderful creativity today, my mind has been changed! In The Meadow is a fantastic set. I can’t wait to order the stamp and coordinating dies. This set just gives me a wonderful feeling for the Christmas holiday. Thank you for sharing your beatufiul work with us. I’m so excited about the In the Meadow stamp set….it so reminds me of growing up, playing in the snow….brings back so many memories! This is such a special set, stamps and dies! A clear winner in my book! I Love it! Ker-plunk. That’s me passing out from hyperventilating with excitement. I’ve loved PTI since the beginning. But this set is hands down my VERY favorite EVER!!!! It is exactly my style. It’s the Holiday set that I’ve been yearning for but didn’t even know it until you revealed it today. I wasn’t going to make Holiday cards this year but now I HAVE to with this set. Thank you Nichole for knocking another one out of the park!! You ladies have hit out of the park with this combo! I need a second job! the child riding the sleigh is sooo cute ! hurry tomorrow! What a fabulous set of stamps and dies! I especially love the Front and Center die! Very clever! What fun! I love that new bag die!! Wow this stamp set with the dies is the best yet! I enjoyed picking out all the detail on the gift bag. Wow, these stamp and die sets are amazing! 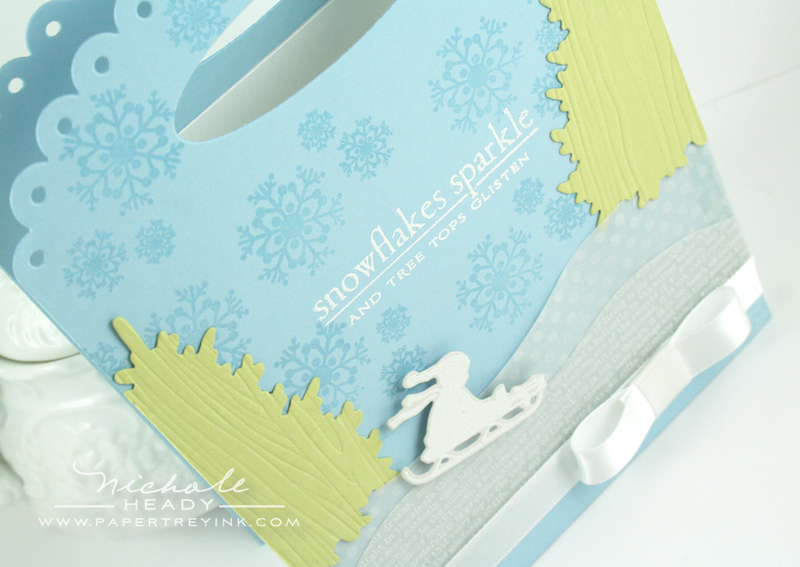 I love the traditional winter and holiday images…The curved snow die is genius! OK, I just envisioned myself on a winter’s day, doing nothing but drinking warm chai, watching it snow outside, and creating cards with these stamps and dies…not a care in the world! *Sigh* Well, at least the stamps and dies are a reality!! I am in so much trouble. What talent and the ideas are out of this world amazing. What a team…Creativity at its best!!! I WANT IT ALL!!! You can create cards long after the holidays are long gone…Be blessed PTI!!! You are the best!!! This set is so cute!!! 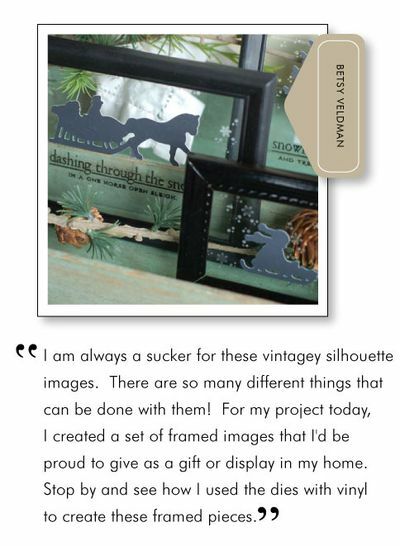 I love the snowdrift dies and the DT projects are AMAZING!! Just wow! This is so much more than I could have believed… stunning yet simple in design. Lovely! Oh my word! I like to say that I don’t buy all these supplies for me, I am a giver – I make all these things as gifts. I’m so generous and modest too! SO, when I saw the Front and Center Die I might have swooned a litte. Wow – todays posts are wonderful. Can’t wait to get my hands on these items and get creating for Christmas. Another STUNNING set of selections…………the samples are gorgeous!! I love the stamps and the dies. Can’t wait to get them to make my holiday cards. Thanks for all the great ideas. PT has such a variety of images/styles this year for the holidays. From retro to vintage, they are all inventive and beautiful. Amazed, as usual, at all of the fantastic creations! All of the design team have done such an amazing job this month!!! So many wonderful items to choose from. Help!!! I love, love, love the front and centre die. This may be my favorite release EVER!!! Love the images and the sentiments and how they combine seamlessly!!! You have created a wonderful release, the designs are incredible, and your design team shared a multitude of ideas! I am smiling here!!! This is such a fun winter set. I look forward to using it — and I love the bag front! I looooooove the In the Meadow silhouette images and dies!!! I especially love the horse-drawn sleigh and the child on a sled! Those dies are all amazing!! There are so many ways I can think to use them. Oh how much fun I could have! Oh my goodness, I love, love, love In the Meadow…set, dies, just gorgeous!!! Love the nostalgic feel with the old fashioned sleigh ride! This is too cute! Oh my Goodness, I am in love!! How wonderful are these dies and stamp set!! The DT samples are just fabulous!! Makes me want to see snow outside my window!! Oh Geezzzz!!! My list is so long. Love the front and center die. In the Meadow is fabulous. I LOVE the Meadow set and yay for the snow drifts die! That is going to be such a useful one! Such great vintage images!! The projects shown today are outstanding!!! PTI design team are so amazing!! What a beautiful set Nichole! I love all the coordinating dies too. I can see so much versatility in these. Gorgeous projects. *GASP* I am sooo in love with this set of stamps and dies!!!! OMG!!!! I cannot wait for release day now!!! These are AWESOME!!! LOVE the projects, DT!!! Love all your creative ideas – the sheet music background is going to be a must as well as that front and center die. So hard to decide on the winter stamps – love them all! Ohh I’m in LOVE! In the Meadow stamp set will definitely be coming home to live with me. So many possibilities!! Very cute! I love the bag die great for party favors. The Silhouettes are so classy. Can’t wait for the 15th! Very versatile set the stamp and the dies. I first saw the sneak peak. Just love them! Oh, I love the possibilities and the inspiration for this set! What a great idea for the gift bag die! Love how Michelle used it with the PTI boxes! This is amazing! Would be so excited to win this set! Thanks for the chance! Wow! This set and the coordinating dies are amazing! After looking at all the projects from the DT, I am just blown away by all the different scenes you can create! The Front & Center #1 die makes a beautiful package too – love the bigger size. Thanks for all the inspiration! These silhouettes are so beautiful. LOVE the sentiment too. I wish I had more Christmas cards to make when I look at these amazing samples you and the DT have created! Stamps and dies-brilliant! Wow, I love this set. I’ve been waiting for the in the meadow die to come out. This reminds me of my younger years watching the holiday movies on tv. Everything is amazing. Once again I am blown away by all the inspiration today! In the Meadow is an awesome set, I can’t wait to put it to use! Front & Center #1 is beyond fabulous and there must be more bag dies to come since it is #1!! I’ve died and gone to Christmas stamp (and die) heaven! In The Meadow might very well be THE most incredible set I’ve ever seen! the sleigh, the sled, the deer AND matching dies! If I could only have one more stamp set for the rest of my life, I think this would be it- just can’t tell you how much I’m loving it!!!! The snow drift dies are amazing too, and a must have for someone like me, that can’t make a nice curved line to save their life- hee! Thanks once again for a spectacular release! I love these images, especially the horse and carriage. The entire release has been stunning! wow, that gift bag would be useful all year. I would love to have it! Oh! Those dies are fantastic. Wow!!! These dies and stamps are absolutely fabulous! The Front & Center die is genius! In the meadow is definitely my favorite set of this release!! It’s gorgeous! And all those dies….*swoon*!!! I really love the idea of Front & Center! What a clever way to make custom baggies that are larger than the Favor It die series…love it!!! Gorgeous projects and wonderful inspiration…thank you!! Oh my… This should be an easy sell to my husband! I can use the snow drift dies and fabulous deer and animals on our cabin scrapbook layouts! And the sentiments have so many possibilities! LOVE! All of the new stamps and dies are wonderful. Truly love the snow drifts – can’t tell you how many times I have cut those out by hand! I am IN LOVE with this set! Oh my goodness! You had me at the deer in 2 different poses, oh, and the snowman, and the tree……..! Wow, this is so cool! I love that Front & Centre gift bag idea and how you used it with the In the Meadow products! All I can say is that I NEED the products at my house RIGHT NOw! Lol! I’m excited too because if there is a front and center #1 die, that means there are probably MORE coming! Woo hoo! I love creating matching packaging for my cards and gifts! I’m in trouble! I can’t decide which of the things in this release is my favorite! am I going to need to get it all??? Great samples! Loved Lisa’s frames! My siblings and I actually had a sled like the one in the silhouette image. I remember the thrill of the chill on my face, and the trees flashing by as we raced toward the frozen lake! I feel like a kid at Christmas when I think of it. These images bring those memories to mind, as well as beloved Christmas Carols. The Front and Center bag is a brilliant idea! I have lots of ideas spinning for that one. Charming and Heartwarming Nichole! Love the new dies….takes me back to a more simpler time. Beautiful set with a vintage feel! And the front and center die is such an innovative product! Oh goodness I’m in love what fun it be to get a chance to play. The team once more nothing but amazing shares! Very cute set! Love the cards and love the DT contribution of projects! It certainly makes you want all of this month’s sets and it’s not over yet! Yikes! These are gorgeous, the silhouettes are so classy. Brings to mind all my favorite Christmas songs, I’ll be singing them in my head for the rest of the day. Everything is beautiful! I love the silhouette images and the classic look they create! In the Meadow is just awesome. It reminds me of going to my grandparents when I was a child. You gals never cease to amaze me with all of your ideas and samples. I love group post day! The sentiments from this set have me singing Christmas carols this morning. 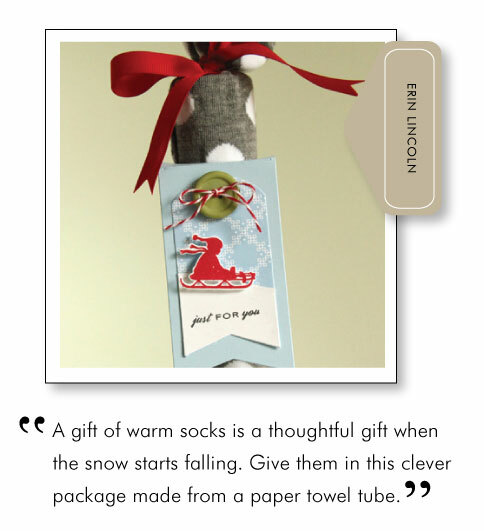 I love the new Front & Center die too — what a great way to dress up paper sacks for gift giving. This set is amazing! While we didn’t ride a sleigh in the snow, it reminds me of our time in Newfoundland – the snow blanketing the town we lived in during the winter. Beautiful! I love the new die for packaging, too. Perfect for teacher gifts this coming holiday season. Wow! I’m really loving all the releases this month. The In The Meadow die collection could have so many uses!! OMGoodness!!! Those dies are adorable!!! LOVE the one with the horse! The scene on the bag is just amazing!! I love the new Front & Center Die! What a great way to create a custom gift bag without alot of folding & assembly. Wow! Just Wow! In the Meadow is just fabulous! Everyone created such beautiful things with it. I can’t wait to get it and start using it. Wow! I am so impressed with the creativity with everything in the new release. The Front & Center die is truly amazing. I can’t wait for more. Thanks! This release could break the whole stamping budget for the whole year! So far I have to have every set and the dies that go with it! Thank you Papertrey and all the designers for all the inspiration!! Love, love, love! I admit I wasn’t much interested in the sneak of this set (the nativity stuff caught my eye instead), but now it’s high on my list. It is so well designed! The dies themselves have lots of possibilities too. I love the sentiments! I need the snowdrift dies – love them outlined in glitter. And gift bag fronts? LOVE it! Love, love, love this set! So classic! With every new reveal set my wish list grows and grows! At Christmas time I just love the Currier and Ives look. The sillouettes and coordinating stamps just bring up childhood memories. Just love them! I am really liking the vintage feel of the new dies! And with so many “scenes” to create at such a great price!! Oh my goodness I’m in love! In The Meadow brings back memories of all those chilly winter nights as a kid, impatiently awaiting Christmas and reading stories with my mother of Christmas’ past. and it just gets better with the Front & Center die! Nichole your Snowflakes Sparkle gift bag is gorgeous! I’ve already added it to my Pinterest Christmas folder! I love the new front & center die. Very useful! And In the Meadow is a gorgeous vintage set!! Wonderful new dies! The Front & Center die #1 is brilliant. So many great dies and stamp sets this month – I say that every month, but it is true. Love it all! What a lovely idea! Love all the silhouettes you’ve shown us – brings back memories of sled-riding as a youngster! Beautiful ideas from the DT, as always! Love it–esp the rolling hills die and the gift bag die. In the Meadow is a lovely set. And I so in love with your vellum hills. I just have to get those dies now. Perfect hills each and every time. The silhouettes, the dies! My resolve not to buy anymore Christmas sets (they are my favorite) just crumbled. You’ve done an amazing job once again. I need to find a better paying job. I love the new dies!! All of them are awesome! Sadly I won’t be able to adquired them right now!! soon I promise!! I love Erin’s gift tag! I can’t tell you how smitten I am with these stamps and dies. I have been all over the place looking for Christmas IMAGES (there are so many sentiments that I like and have) that I really like, and to find some with coordinating DIES is just incredible. and such a reasonable PRICE!! Thanks so much! I hope I win, but I will have no problem forking over some cash for these babies!! Beautiful set! I love all the sentiments you’ve included…makes me wish Christmas/winter were here now! Absolutely fantastic- both the creation of these new sets and the samples that you all created!! Love the interplay of nature with wintertime fun that many of the cards evoke. Oh you found my week spot .. Silhouette stamps, snowman and nature dies…oh my!! I am in LOVE!! Great release, can’t wait!!!! Oh my…I shouldn’t be surprised, but my mouth is still in awe position! I’m struck by the wonder, the beauty, & the excitement that exists in this release. I need a 2nd job to pay for what I want, which is everything! Thanks PTI! Sigh…..so very much in LOVE with this set and all of the dies…..absolutely Fabulous!!! I am seriously WOWED. Simply amazing. Everyone did such a great job with their projects. The gift bag possibilities are endless with the Front and Center die. Absolutely LOVE it. In the Meadow just helps me keep the “fun” in the season! WOw. Love all the new products today! I really like the look of the little kids sledding and the way it comes together with the hills is just brilliant! Can’t wait for the 15th! What a beautiful timeless collection! For me, it conjures up memories of family sleigh rides up in the great white north. Good times. Thanks for the reminder! I love the gift bag idea…what a genius concept. The new stamps and dies are beautiful. They make me wish for snow! Thanks for offering the great prize! The front and center die is sooo unique! It made me think about christmas gifts for everyone at work and what i can put in the various bags! I hope that die will fit in my cuttlebug because it really looks perfect! Simply fantastic! In the Meadow is so versatile, there are so many ways you can use this set and dies. Great projects by everyone. The Front and Center dies are so cool. I see it is #1 so I am looking forward to more. This by far the best release ever! I love the front and center die! So smart! What an absolutely beautiful set of stamps and dies! I cannot wait to get my hands on them for sure. Gorgeous samples today too by Nichole and all the very talented PTI ladies 🙂 Thanks for all your hard work. Oh no! This set now has moved from “really want” to “have to have.” I hope I don’t like anything tomorrow :-). I am absolutely amazed every single month that PTI comes up all of the wonderful, must have products! Love this set and all the new dies. Makes such magical scenes of the beautiful winter season! Everyone’s projects are awesome. That box die is amazing…can’t wait to make my own giftbags! Thanks for all the beauties! The front and center die is brilliant! What a great idea! I also love what Betsy did with the In the Meadow stamps and dies. Such a lovely addition to a home holiday display! Great post today, team! I think this is my favorite PTI release ever! I literally gasped outloud when it came up on my computer screen!!! I am so very excited about this whole collection and can’t wait to own it! The design team’s creations area amazing as usual! Awesome work girls!!! This is such a beautiful set! I LOVE every single project that was done today. Such great ideas! these are absolutely adorable. i love the dies that go with this set and also the front and center die. Love the In the Meadow die and stamp set. It reminds me of the silhouettes my great aunt had in her house many years ago. Good memories. I am getting so in the holiday spirit after visiting all these crafty ladies blogs! The silhouette dies and stamps are great. So much inspiration, so many things I want to try!! I love the sleigh & sled images – also the tree is lovely. Over the top….lovin’ it all!!! Pure genius…(don’t you get tired of me sayin’ that??? Just sayin’……………..
Love that little sled! it’s precious! Love this new set and the snowdrift dies! wow! love this set. The vintage look is beautiful. Can’t wait to go check out what the designers did with these. This is brilliant Nichole! Making Christmas gifts is as easy as 1-2-3 now! 🙂 Simply fabulous stuff! Oh my gosh – you’re killing me! I won’t have any money left over for Christmas presents! Love, Love, LOVE! oh i love everything!!! beautiful! Can’t say enough about the new stamp sets dies, absolutely LOVE them. Are you freaking kidding me??? I almost hyperventilated when I saw these stamps and dies!! I love all of them! I grew up in the South, so snow was so rare, but these images were the things I dreamed of, sigh. I still live in the South and love it, but love all of the snowy images. Such great ideas – I can’t wait to get the new items. I just love the new stamps and dies these are fantastic and I just love the one to make the gift bags. I love how you’ve made vintage with such a modern twist with the dies. I am see lots of beautiful and simple cards made with these! Oh My Goodness! The In the Meadow Collection is amazing, defiantly on my to buy list. I love In the Meadow and the silhouette dies! Beautiful projects presented today! Front & Center is a definite must-have for me. It will make my gift packaging a breeze to create! The gift bag is awesome! Great dies and stamps. Beautiful cards so professional looking but hey you girls are professionals!! LOVE LOVE LOVE!!!!! oh my goodness you have completely hit the mark with this set. i love it. everything about it. I love everything. In The Meadow is so nostalgic…lost of great stamping projects can be made with that set for sure. I truly love traditional winter images and these silhouettes are just perfect. Adding dies to the package just makes it irresistable. Fantastic new toys to play with! I LOVE the whole “In the Meadow” collection! Amazing vintage images! Love the Front and Center and In the Meadow Die Collections! Life is good when you have all the right tools!!!!! Thank you so much!!! I love, love, love all the cards and projects today. The in the meadow set is a must and the dies are great. I love the gift bag. This die would be so useful, I could use it today for a gift I have to give tomorrow. The other set with stamps seem so vintage. A wonderful collection of Christmas icons. I love them all! I’m really loving this new set. I can’t wait until release night to place my order. I love your “snow” die. I bought a ruler with this curve, but a die will be much easier than using an exacto knife to cut. Thank you for another great set. I love that you offer so many dies with your sets. Love! In the Meadow is an amazing set and all the dies you revealed today. I’m so excited to get to making my Christmas cards and this month’s release are going to be a big help. I love the sled and all the little animals. This set is so cute. Thanks for the chance to win. I can almost feel the snow crunching under my feet as I look at these projects. I am not excited for the bitter cold of winter, but I am now no longer dreading the snow. OMG!! Love everything about this whole set…stamps and dies. Simply stunning! There is sooooo much here to work with between the stamps and dies, it will make beautiful cards year round. Look forward to seeing what ‘guy’ cards I can make with these wonderful items! I love a stamp set that brings back great childhood memories. In the Meadow is just that set! Thanks for a way to create a trip down memory lane. Great detail, great fun, great collection! As always you and the team have done a wonderful job displaying the upcoming release. Thanks! Oh my goodness… I am completely smitten with everything today! I am officially blown away! I have to agree with Kristii, there went my budget! These are truly wonderful!! What do I buy first? What a lovely set Nichole! These images are so classic. Who doesn’t love silhouettes and with dies they can be layered to give scenes dimension–just beautiful. Thank you.! Just when I think you can’t get any better….you do! These are absolutely fabulous!! These images are what Christmas means to me! I am in love with the In The Meadow Stamp set and Dies, and also loving the Front and Center die!!! Such inspiration!! Thank you soooo much!!!!! As if the silhouettes weren’t cute enough, I think I would be tempted to buy the set just for the fantastic snowflakes. If a $5 set of snowflakes in similar motifs were to show up some time in the future, I’d be a very happy camper. I “thought” I was safe this month (silly me, I should know better by now ;), but OMG, In The Meadow could easily become one of my all time favorite PTI sets!!!! The timeless, classic images and sentiments will serve me for years to come! I just LOVE what you and the DT did with these stamps and dies, Nichole! Way to go!!! LOVE the new front and center die!!! I can only hope for snow this holiday season! LOVE these silhouette images and the simple, but elegant cards everyone made. Cannot WAIT to get my hands on this set and dies. Love your bag! That die is really cool!! This looks like a really great winter set! So fun! I love everything about todays post! Love the images in the set, love the dies that go with it (especially that they are only $14 for everything), and love, love, love! the die for the front of gift bags. Amazing! Everybody has done a beautiful job showcasing this month’s release. I can’t even decide what to order. It’s going to be tough. The snow drift/rolling hills dies will be used throughout the year. What a great asymmetrical card edge. OMG!! I’m in heaven… what wonderful stamp and die set, which has already gone on my wishlist. Tks for amazing inspirations as well! Just have to figure out which card to make! Oh my. Oh my. Oh my. I don’t even know what to say. These are amazing, so fabulous! So clever and innovative and wonderful! Front & Center is another great concept! It will be nice when needing packaging a little larger than the Favorite It Boxes. Loved everything from you and the DT!! Thanks so much! This is the BEST set I have seen for winter!!! I love it! So many fun ideas to use the bag for. I love them all. Wow,Wow,Wow this is amazing. I’m definitely going to have to get these new sets and dies. The bag die will be a must have for me since I’m making 50 gift bags for a shower next May. WOW!! Amazing collections of stamps and dies. The DT posts have so many fabulous project ideas. Can’t wait to see the full reveal. This is absolutely overwhelming! In the Meadow dies and stamps are stunningly well executed. All of the designer projects very inspiring, as usual! And how clever is that Front and Center die?!! Some tough decisions for me to make this release. “In the meadow we can build a snowman. . .” what a magical set and all these dies are WONDERFUL! I love the way you can build scenes with these images and dies, just lovely!!! I love the vintage look! These are stunning! Wow! Love, love, love all the new products. It’s gonna be REALLY difficult to choose which products I’ll purchase from this release. Hmmmmm. Thanks for sharing your talents. Beautiful and you have created incredibly delightful projects – I am in awe!! Wow, beautiful cards/projects. Love the new sets and dies. Love the new dies. I can’t wait for the release. The front and center die is looking so great. This can be used for so many different things for gift packaging in bags. Oh my gosh Nichole, your killin me! I was a bit disappointed with the sneak peaks this month, thinking I did not need any more Christmas stamps… Hah! This set and coordinating dies are fabulous, and the gift bag die… love it! Your project with Front and Center is so cute, and as you pointed out, so affordable. And Becky and Jessica’s projects are fantastic as well! Will you ever run out of ideas?!? I hope not, for our sake! Well done, Nichole! My Christmas budget is going to be tough this time around. So many great goodies to choose from, yet again. I MUST HAVE IT ALL IN THIS POST …….. I adore In the Meadow ……. lovely and the dies …… oh my oh my how I would love for my number to drawn today!!! Awesome new products. Can’t wait for the full release. Oh my gosh oh my gosh oh my gosh!!! The “In the Meadow” set is incredible!! 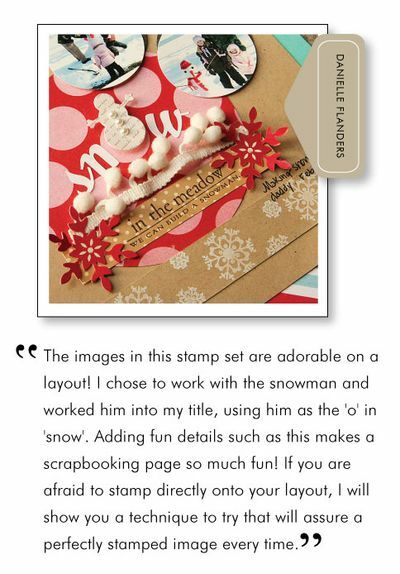 I love the ‘dashing through the snow’ card sample….the stamps and coordinating die set is a must have. 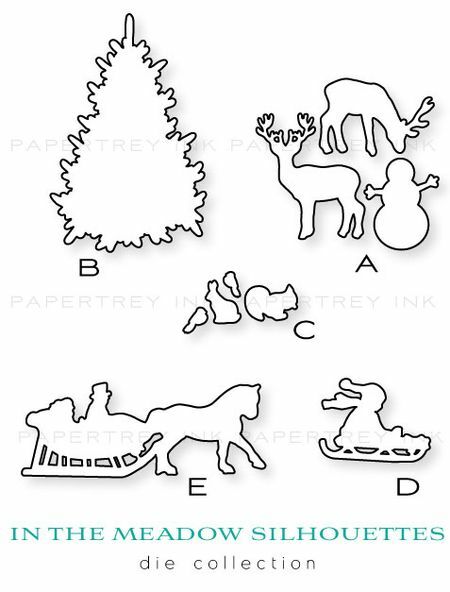 The animals and tree can be used for so many other things besides Christmas/Winter projects!! the silhouettes are absolutely perfect! A truly gorgeous winter and holiday set! I love all of it including the beautiful silhouettes (please bring more and more silhouettes!) and dies. Lovely and inspirational projects as well. Thanks for the chance to win. LOVE LOVE LOVE all the new dies. The ideas are absolutely wonderful! Wow! Love all the new paper products this month!! OH MY GOODNESS! I love everything on today’s group post using the In the Meadow stamps, dies. I also think the Front & Center #1 is the greatest. I have always enjoyed making “genie bags”, and this will make them so beautiful! Thank you from the heart! 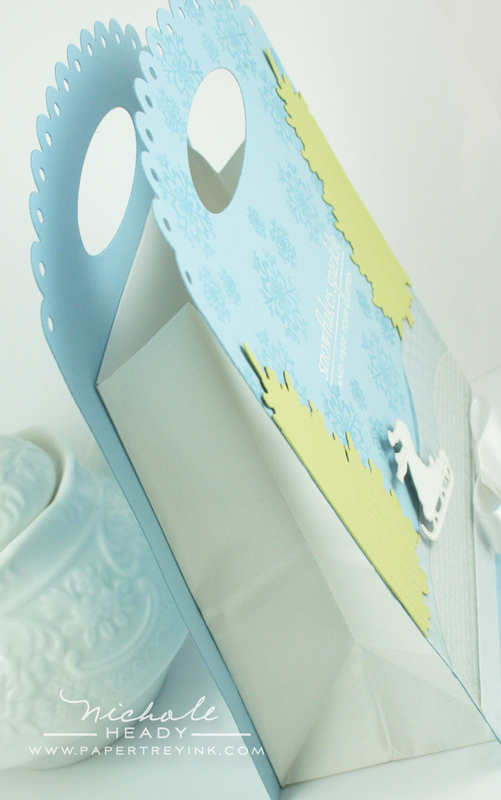 The Christmas gift bag is such a beautiful idea to use for giving small items to family and friends! I like decorating bags, so this is definitely a product that will be used throughout the year. That is my FAVORITE christmas song. I really love the idea of a vintage Christmas and this set fits in PERFECTLY! I sooooo love all of the projects, but I am especially in love with Betsy’s pictures, Jessica’s picture, Melissa’s ornament, and Mish’s tote! You ladies make me do some serious damage to my budget! I love this set and dies! What wonderfully nostalgic/vintagy projects I can create! Love the new front and center die as well as the other dies. What a great release. 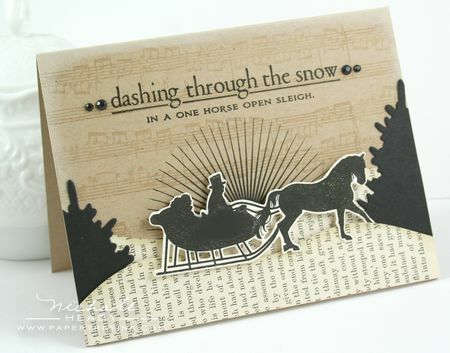 Love the horse and sleigh! And the snowdrifts! Cool. Got to have! In the Meadow looks fabulous! Can’t wait to see the whole set! I am beside myself with excitement. Love it all and adore the projects! Everything is beautiful! But, the center die is my absolute favorite. You can make such beautiful bags with this and sooooo many possibilities! I have to have it! Wow, once again I was thinking that I didn’t “need” much this month. Then I see the DT and all their magic and I am blown away. 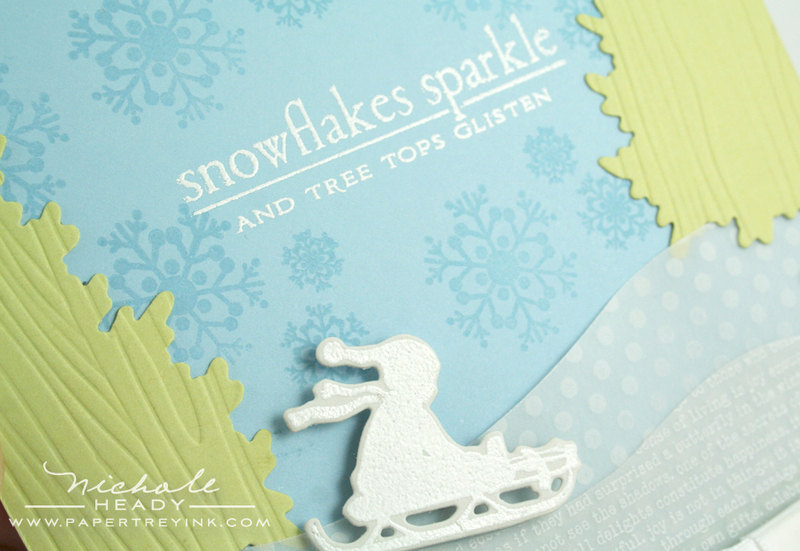 I love the sleigh rider stamp, the tree, and that darling snowman. Oh and the bag die is coming home with me, what a great idea. Thanks so much! These are just amazing. I love the vintage look and will be using these right away! What a beautiful release. This is really great. Would love to get this. WOW! So excited to see these! I can’t believe how amazing those dies all look with the sleighs and sledges – what awesome detail, and besst of all, I’m dreaming of how much time they’ll save me when I don’t need to fussy-cut all those images!! You are killing me with the silhouettes. They are my weakness, you see. Well, one of my weaknesses. i especially am drawn to the snowman w/ the cardinal because i collect snowmen & my grandmother collected cardinals. also, i love the deer because occasionally some wander into my back yard. the “in the meadow” dies are something i have been hoping for. thanks. Oh my Gosh!!!! What lovely dies and stamps, it just keeps getting better and better. I find myself singing Christmas carols out loud as I skip through the DT posts! And I thought this set wasn’t for me…way to prove me wrong, AGAIN! ;o) Great samples, ladies! I just love this new new set and the dies make everything so easy. The bag was amazing and I can see little gifts getting tucked inside. The best part of this set is that it can be used to make vintage cards as well as more current day..so versatile and fun!! Wow! Who wouldn’t love these new dies! These can be used in so many ways. Love everything in this release so far! The Front and Center die is brilliant. I am hoping since it is listed as #1, there will be more to follow. The applications for it are endless. I love, love, LOVE that Front & Center die!! What a totally cool idea. I would use that to gift packaging for EVERYTHING!! This is my favorite group of items from the whole release!! I just love the In the Meadow set and matching dies. The Front and Center die is amazing! I love how PTI comes up with the best new products on the market!! Thank you! Best Christmas set (and dies =D)! Loving the Front and Center too … so much possibilities! Beautiful!!! And the matching dies are just awesome! Brings back lots of memories of sledding down the snow and ice coverd hills in my neighborhood many years ago! I love everything, as usual!! i am loving all the options that you are giving us with the creation of all these new dies. I am very excited about the snow/meadow die. What lovely additions to this release! I love all the dies! Another must have set. I love all of the matching dies. PTI continues to amaze me each and every month. Swoooon…………I must have ALL of this. Blown away!! Simply stunning!! I love the new dies. I can’t wait for the release day. the sleigh and horse transport me to the backseat of the car singing “over the river and through the woods to grandmother’s house we go….” what an amazing release! I’m simply in awe — the variety of ideas presented here using your adorable stamps, dies, accessories proves that no matter what our style, we can all easily create perfect Christmas memories for our loved ones! This entire reveal with all the DT’s projects has me dreaming of dashing through the snow and in the meadow building a snowman, all while expecting 102 degrees here in the desert today! Simply in AWE!!! Your “In the Meadow” dies are AMAZING!!! Haven’t seen anything like them–love ’em!!! Oh wow!!! Over the river and through the woods we come!! !Love it! I love the In the Meadow set!! Great stamps and dies!! 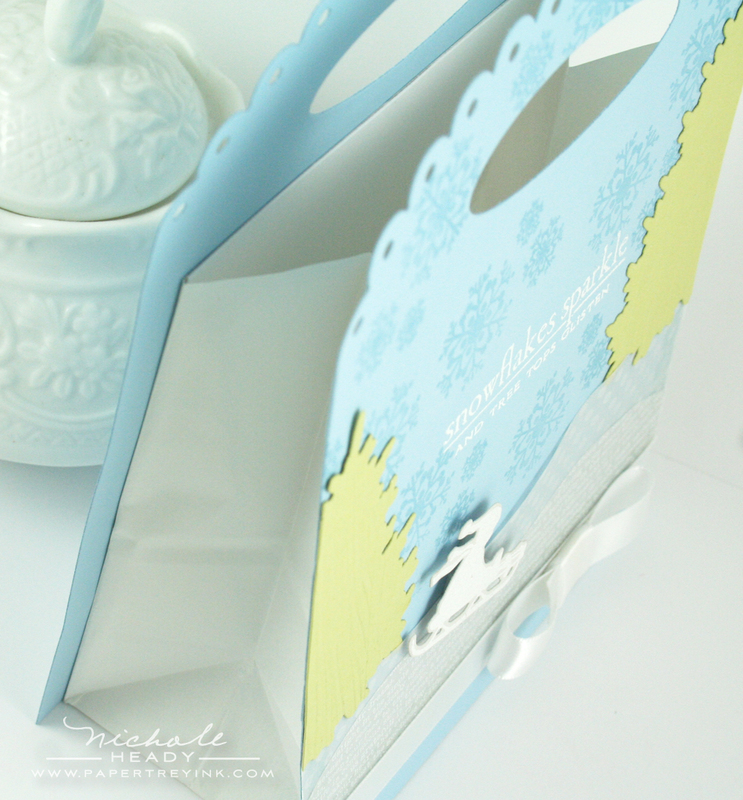 I love the gift bag that you made with the Front and Center die – gorgeous!! Over the top ladies! I will surely make heartwarming Christmas goodies this year with your designs! Thanks for the inspiration!! Love, love, love the front and center die! So many fantastic projects today, you are all so amazing!!! Oh, wow! If there was ever a collection I rrrreeeeeaaaaalllllyyyyy wanted to win, it’s this one. 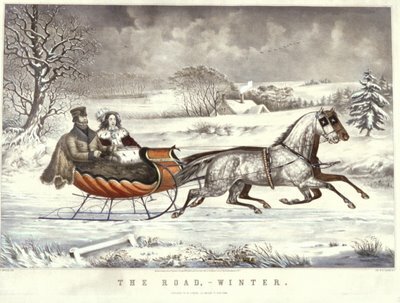 I have always been drawn to Currier and Ives prints since I was a kid. This is so beautiful. I love it all! Wow ladies such wonderful projects! Is it release night yet? Love all the dies and all the creations from the design team! Everything is amazing! Love the stamps & all the dies. All the projects look wonderful. TFS. Just when I think that I can resist odering anything from this release, you come up with a set I can’t resist! You must be channeling Currier & Ives! Love the “in the meadows” stamp and dies. I love the ability to make smooth, size correct snowdrifts. Love the bag die. Love it all. Love all the stamps and matching dies, love the silouhette images! Not sure how to spell that though! Wow, I have to comment on this collection! You have clearly outdone yourself yet again. What a beautiful and versatile set of crafting goodness! WOW – you had me at the very first card. This is the best day of peeks so far! In the Meadow is spectacular!! Fabulous images and dies. LOVE that gift bag idea. The In the Meadow and In the Meadow Silhouettes stamps and dies have all the childhood memories! The front and center die along with the made of snow and music sheet sets make this a knock-out complete package! My husband says today he thinks we should apply for a work visa for the USA. And I’m thinking “Yah, I can be close enough to get some PTI stamps!”. These are gorgeous! Gorgeous set! I love all the silhouette stamps scheduled for this release! And the new dies are amazing!! Goodness how I love everything you showed today! I have been eying silhouette Christmas stamps from another company for a while now and am so glad that I did NOT get them. I absolutely love the Front and Center die. What a super idea! I love everything in the new set, and once again that gift bag die could be used in ANY season. Yay! How is it HUMANLY possible to create this amazing level of beautiful products on a monthly basis???! This month’s release is absolutely breath-taking! Great job! I absolutely LOVE everything! This set is amazing, the dies are perfect, and the design team projects are so beautiful! My cart total keeps rising! Very cute and lots of fun! 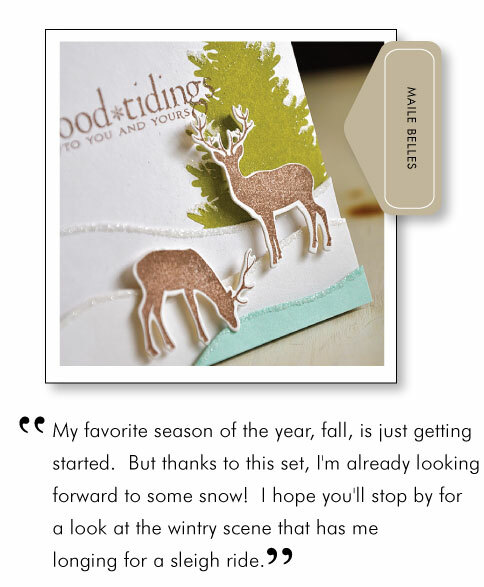 I’m very excited about the snowdrift dies! You’re definitely getting me in the holiday spirit! LOVE! Love “In the Meadows”!! This is such a great set!!! Can’t wait! WOW! Such great ideas:) decisions, decisions, decisions! LOL! I love sets that are wintery without being christmasy. I am so excited to visit the DT blogs! 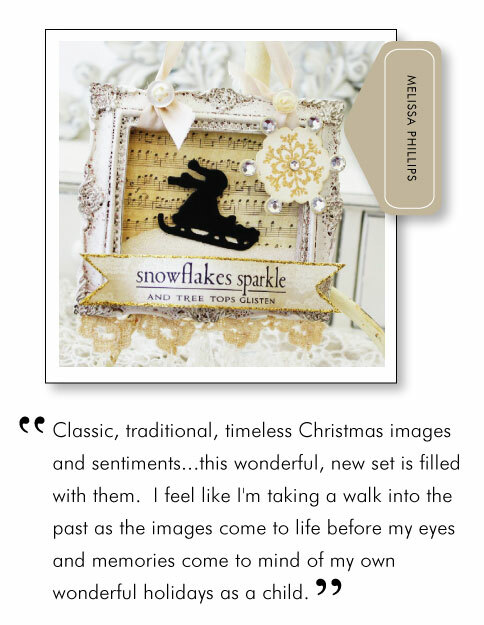 Love that bag die and the sleigh set (especially those beautiful sentiments)! Amazing projects by all the design team members – love to see all their different styles! Such a fun vintage look! And that Bag Die — just so clever and just in time for the holidays! Thanks for the chance to win this prize!! I cant wait until the 15th!! Gorgeous! those dies are amazing! Oh My!! PTI is genius!! These Holiday stamps and dies give me such a heartfelt cozy feeling. They remind me of Christmases gone by but never forgotten… I have always dreamed of riding in a sleigh bundled up in blankets,drinking hot chocolate (or mocha lattes from Starbucks-LOL!) and of course the sound of sleigh bells faintly tingling as we glide over the snow drifts… I can hardly wait for this release! Love the new die for the lunch bags – very cool and easy way to embellish a package – making it a nice gift. Love all the new dies for the deer, sleigh, snowman etc. CUTE, CUTE! Love this set, so charming. Wow, this is so amazing and beautiful! I love everything that was shown today! !…oh, the memories of childhood!! I love it, I love it, I love it. This set and dies are really too cute for words. I live in Florida and still think I need it all! Amazing set of dies!!! I also love the front and back die for the lunch bag. Such clever idea to decorate a plain old lunch bag. Love all the design team members’ projects!!! Just beautiful!!! Papertrey has outdone themselves this time!! I must have everything that was introduced today and I can’t wait to get them! I had my Christmas cards all planned for this year – – the sheet music background with last years YOF Poinsettia – – but now you’ve thrown this at me!! How can I resist the vintage look and all the fabulous dies?? The framed images are beautiful… and in hand decorated bags, they will be the perfect gift! THANK YOU PTI!! These are stunning!! I absolutely love all of it. The examples were gorgeous!! This release is amazing!! Sooo loving the snow drift dies, this reminds me of the snow we use to get when I has a kid. All I had to worry about if school was closed – those were the days. Congrats(once again) on a fabulous release. It is ALL just so gorgeous!!!!! I am super impressed, as I am every month!!! The Front and Center die looks like the “shining star” of today’s post. I can hardly wait to play! I really love all of the sentiments that come with the In The Meadows set. I am also in LOVE with the Front and Center #1 die! Brilliant! Thanks for the chance to win some of your AMAZING products! Oh dear … I am absolutely SWOONING over these new dies and coordinating stamp set! Oh I am in love. This is my favorite by far. Everyone’s ideas were so inspiring! I just booked a sleigh ride for our family in December. . . this would be perfect!!! Oh I love this set. Thank you for the great dies and stamped images. LOVE! You’ve done it again Nichole! Everything is so nice and crisp. I can’t wait to play with this new release. My favorite are the new dies that coordinate well with the stamps. Thank You! For the first time ever, I am tempted to click the “I want it all” button on release night! So many beautiful card samples from the design team, so many dies and stamps that I can’t do without! Beautiful! So traditional and lovely. Wow, I am totally in love with In The Meadow Silhouettes and all the dies! I also loved everyone’s take on this wonderful new set. Christmas songs are playing in my head now 🙂 Thanks for this beautiful set! I can’t believe this amazing stamp set and dies. The sleigh is my favorite image as it takes me back to the classic Currier & Ives Christmas images. I can’t wait to create a beautiful winter scene. And the gift bag die will get tons of use. It’s brilliant! Thanks for the chance to win! Today’s releases remind me of playing in the snow at my grandparents’s farm when I was a child. Complete with the wildlife that was always around on that beautiful white landscape. omigoodness! The dies with this release are just so special- and you had me at the stamp sets. I can hardly wait to craft away…. Wow, wow, wow!!! I absolutely ADORE this set. I think that little child on sled is going to show up on my Christmas cards this year – fantastic! I love the entire die collection for “in the meadow”! I especially like how you die cut the tree and embossed with woodgrain. I may copy that for my cards! I love the vintage feel of the In the Meadow stamp set and the dies look great! I love the Front & Center die. What a great idea! Beautiful! I can’t wait to get the front and center die!!! I see lots of uses for that from BDay party goodie bags to treat bags after our parties! This new set of stamps and dies has totally wow-ed me! Did not expect anything like this; over the top gorgeous! Love all the vintage looks these sets can bring! That bag die is pretty cool – I’d love to see the DT show us some projects using it! 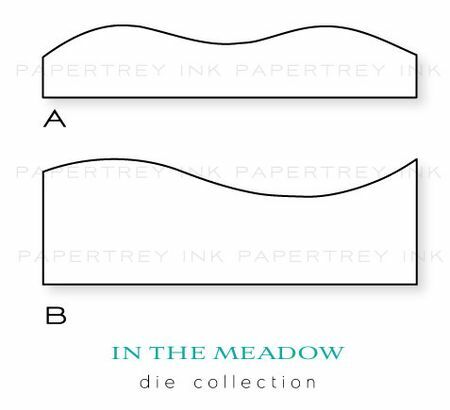 I’m also excited about the In the Meadow die collections – fun! Love the bag idea!!! I can see the winter scenes all over my kids school as I make all the teacher gifts from the PTO. You never cease to amaze me month after month! Loving this collection. Everything is so wonderful and so reminiscent of long ago Holidays. What a beautiful collection. I adore the little sweetie on the sled. And the horse drawn sleigh and the Front and Center die. All such fun! Thanks for sharing and the opportunity to win a prize! love these! The dies are just wonderful! I can’t remember another introduction day when I was so in awe of the products and the DT creations! Thanks so much for the beautiful additions to the holiday! Being a country girl at heart, the “In the Meadow” set/dies resonate with me. The snowdrift dies are especially wonderful as they are so versatile. I am in LOVE! The child on the sled and the horse drawn sleigh are spectacular! I can’t wait to have the deer and matching dies – my husband is a hunter and these will be perfect for him. Nicole I think this is one of the most fantastic collections you’ve ever had! Love all the little die cuts especially. So cool! Can’t wait. Just amazing!! Great new dies & stamp sets!! Everyone did an amazing job with them!! Thanks for sharing!! Wow…what a fabulous stamp set and dies!! I love the vintage look of them, and how amazing the sentiments are!! Such great packages…here are some more must haves!! Beautiful and oh do versatile! How can we not buy everything! I am at a loss for words! WOW! Love, love love this stamp set and dies!! The In the Meadow Silhouette dies look like so much fun to use! They remind me of when I used to go sledding near our house in the woods! And snowflakes? My all-time favorite image!! I’m just amazed by the wonderful sets you come up with every month. You should stop releasing so much, my wallet can’t keep up. Also the incredible talented design team dazzles me time and time again. I NEED to win the lottery haha. Thanks for the chance to win! It is ALL so amazing! This months release is WOW for sure. ALl of it goes straight to the top of my wishlist. Gorgeous projects everyone! I don’t know where to begin. This is a very versatile set. I cannot wait to make a card with the tree and the animal. And then one with the sledding boy and the snowman. The possibilities are endless! Another winner girls! I love the new set and dies! Especially the horse and carriage! Not to many people can get a horse to look right for some reason. I’d definitely say that you’ve nailed it! Front & Center is awesome! What a great way to really dress up my gifts bags this year! The meadow set and dies are wonderful–can’t wait to order. Thanks for sharing wonderful projects–all of you. I am in love! (Shhh…don’t tell my husband!) 🙂 Love these dies and stamps! Can’t wait to play with them! Thank you! What a fab set … I love the new dies! This whole post is so amazing and thoughtful with all the details. My eye keeps getting drawn to the boy on the sled and my mind longs for snow and sliding down the hill, even though I haven’t gone sledding for decades. I may have to change that this winter. Beautiful!! Love the matching silhouette dies! Oh wow! I love this set & matching dies! 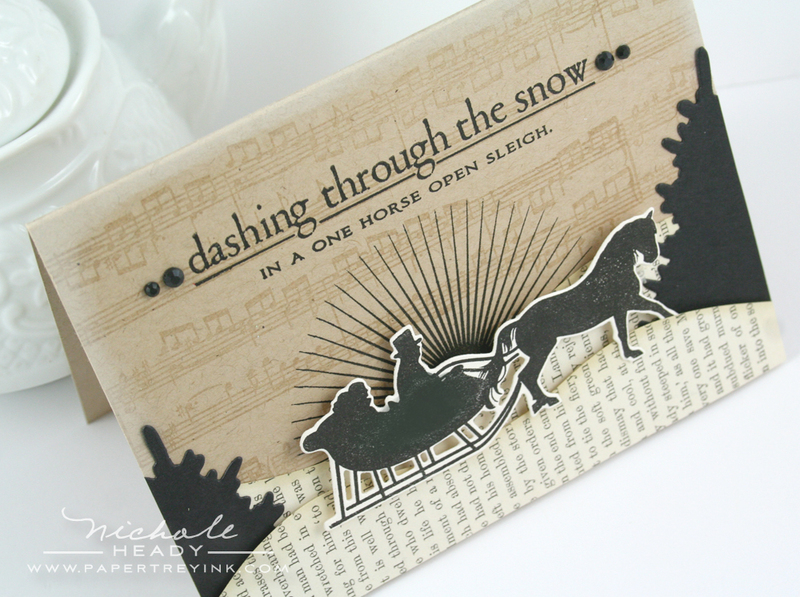 Your dashing through the snow card is so vintagey. This is a must have set. Thanks so much. Amazing!! I love the images in this set and it is wonderful to have matching dies for them. This is a must have set!! Hope you have a lot of stock on hand!! love it! You gals are the best. Thanks for everything! Yikes, I was not prepared to feel I HAD to have In the Meadow. Time to refigure the ol’ budget! Oh WOW is all I can say! This set is crazy awesome!!! You have REALLY outdone yourselves! The silhouettes are so striking! And I can’t even express how brilliant these new dies are! No more agonizing over trying to hand cut snow banks! Amazing! Just when we think you can’t come up with anything more creative, you pull out the stops again! This set of winter images with dies is just incredible. Can’t wait to decorate and embellish all my Christmas & winter projects with them. WOW – I don’t know how you keep coming up with such innovative ideas. The projects shown bring such a vintage feeling to the coming Christmas season. In the Meadow is such a wonderful set. The samples created by everyone are so inspiring. A must have for sure. I absolutely love this stamp set and all of the matching dies. The snow drift dies are a must have. Your projects are beautiful – I love the gift bag! Wonderful stamp and dies set. In The Meadow reminds me of past times, slower times and memorable times. I can’t wait to play around with this set. I love In the Meadow!! Such beautiful images!! And once again, more must-have dies… I need a bigger supply budget!!!! I love the Front & Center die! Both Nicole’s idea with the bag, and Mish’s using the plastic boxes, of which I have bunches. And In the Meadow reminds me of holiday snow and fun. Just when I thought it was safe to look at the site! I love it all, the team has done an amazing job this month!! Another beautiful stamp set and dis to match. Love the nostalgic feel to the stamps.. wonderful. Love the new vintage images and dies. There were many which caught my eye including, Besty’s framed silhouette image, Mish’s tote and cards and of course Melissa’s fabulous vintage frame. Cute stuff! I adore the Front and Center Die! I love the Front & Center die. What a great idea! This will allow us to package snacks or gifts in a little bit bigger bag and still make it look super cute. I am really loving the sneaks today. I think these stamps and dies will get so much use, they are just wonderful. Thanks for the chance to win and thanks for another great release. Can this release be any more amazing! Love the silhouettes. Awesome presentation. Well, let me pick my jaw up off the keyboard… This collection is gorgeous! The products and the projects you shared today really are over the top! And versitile too! Yippee! dashing through the snow card…cute. and the frames…nice. soooo remember sledding in my younger days…but not so much now that we live in the desert…ha ha ha!! fun though to do just that…relive memories!! I am so excited about the dies and the profile stamp images! The entire DT knocked it out of the park! OH MY GOODNESS!!! This set is amazing, I can not wait to get it and play! I really had myself talked into not making my Christmas cards this year…until I saw tonights reveal!! Love everyones projects!! You and your designers are always up-to-date with the newest trends. Love the vintage look on these designs. This is the coolest concept I have seen in such a long time. Create your own beautiful winter scene…the design possibilities are endless! And the die that dresses up a plain paper sack – genius! I adore it all!! What a lovely concept! I love the rabbit and deer, but all of these images (stamps and die cuts) have a wonderful old-fashioned feel that makes me feel warm and nostalgic. The snowflakes are really nice also. The design team have outdone themselves once again with all these great ideas. WOWZERS!!!! LOVE everything you showcased today!!! JUST BEAUTIFUL!!!! That sound you just heard was the sharp intake of breath coming from my house…gorgeous. Wow! This entire collection is beautiful! I love it! I can’t wait to see the full reveal of ” In the Meadow” – well, let’s just say that I can’t wait to put that set in my cart!! Awesome projects today. Heather J.
Oh my…there’s a rabbit? My vow to be good this month went right out the window. Got to have this set for sure. Maybe I’ll get lucky and win it! I love all of this – the images and the dies. I love how each of the design team members adapts these to their own distinct style. You all give us so much inspiration. I can’t wait to get my hands on these and start having fun with them. having a hard time leaving you comments…keeps refreshing instead of giving me the captcha code. i love this set and the dies. the dt’s creations are all so beautiful! I am in love with everything in the post today…and yesterday…and the day before that! How am I ever going to choose? Thank goodness for that “I want it all” button. Wow, I am amazed by everything. In the meadows set…. looks like that’ll be in my cart Sat morning! I do love the gift box die. I see endless possibilities with this, just incredible!!! These are incredible… oh, everything. I see endless possibilities with the gift bag die! I see everything in my cart on Sat morning!! Wow! The Front & Center die is brilliant, and such a wonderful and inexpensive way to make gorgeous gift bags. Love the concept! In the Meadow is so wonderfully classy with the beautiful silhouettes, too! 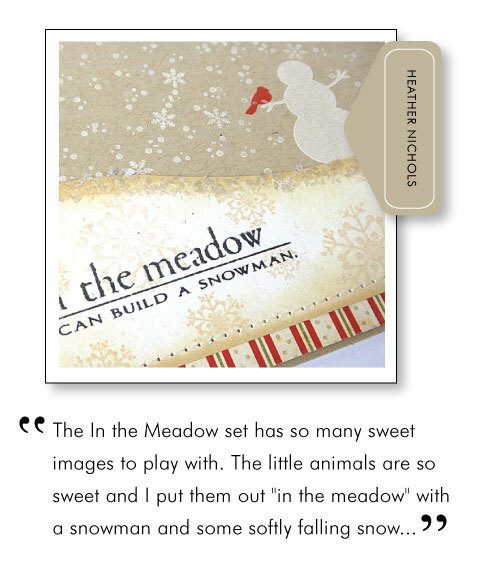 I love all of the new “In the Meadow” die cuts and stamp images shown. I really am eager to see more of the Front and Center Die Cut. I can see lots of possibilities for these. Great way to package gifts, favors, treats!!!!!! The Design Team has really done a great job! I love how they create more and more original work. You all are fantiastic!!! This is the first time I write a comment on your blog, and it is because these new products are just AMAZING! I consider myself a crafty person, but some hard circumstances in the last year have kind of stop my “muse”. That is until NOW. I got my first order a couple of weeks ago and I’, hooked. My favorite for this release? Star of Wonder! WOW! Great reminder of the true meaning of Christmas. I’ll be using this set a LOT!!! Thank you for getting my “creative juice” back. You girls rock! This is just an amazing set of dies and stamps! I love that it portrays the beauty of winter. And who doesn’t love the silhouettes?! I love the nostalgia of the In the Meadow set!! Just beautiful. KRAFT.AND.BLACK. Who would have thought that they would have made the PERFECT holiday card? I LOVE IT! Yes, it is true, all of the projects you and the DT created are amazing, but OH MY GOODNESSES there is something about that kraft and black card! Thanks so much for the chance to win some of the amazing stamps and dies for this release! AHHHH! I love this time of the month! I am always so overwhelmed by the design teams’ projects. They are simply outstanding. I just love the In the Meadow set. It is so classy. wow. these are my favourites. Such nice shape for that tree and the sweet deer. and that nice slade and those dies. wow, poor me, I must have them. poor me. Unbelievable! Where do you come up with these great ideas? I want to have it all! I LOVE in the meadow! It evokes such sweet memories of Christmases past. I’m so glad I’m moving to Idaho where I can enjoy a white Christmas again. 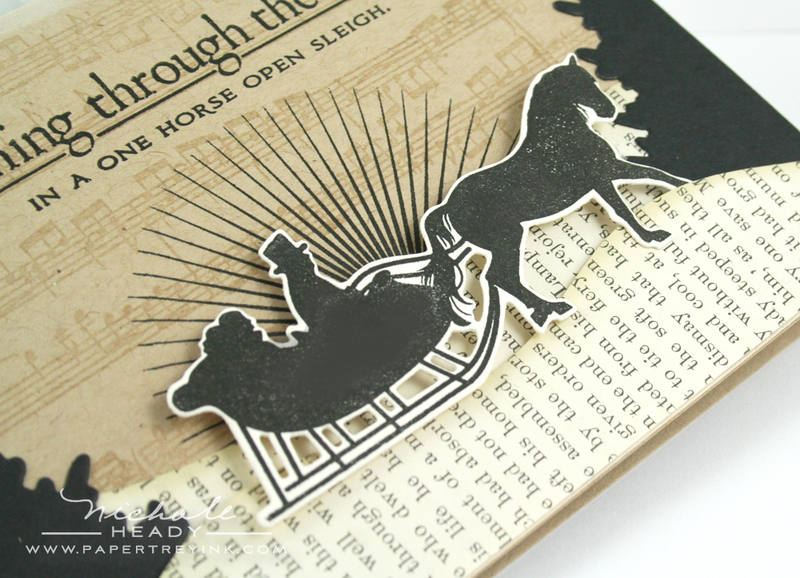 I love the vintage look of these silhouettes and the dies are so fun just on their own! Can’t wait to see more!! What gorgeous images and love that you have dies to coordinate. You make the arrival of cold weather more tolerable with these wonderful winter sets. Today’s reveal is my favorite of this release. Love the stamps, the coordinating dies, and of course, the projects by you and the DT. And the Front & Center die…..it’s a must have. Guess what my girls’ teachers will be getting this Christmas? Yep…a gift box created with this new die. Thanks for the amazing inspiration, Nichole. In the Meadow has all the wonderful, classic, Currier & Ives-type images that I love, and grew up with in my family’s summer home. Ahhhh – you made my day! The many dies will certainly help with dimension when using this set. So perfect! Oh my gosh! These are fantastic! I’ve been humming ‘Over the River and Through the Woods’ all day! Makes you want to fix some hot chocolate! Love them, love them. These are darling images and it’s so awesome to have dies to go with! I just adore the snowman and the rolling hills! I love the front and center die. OK, I love In the Meadow dies too. Wow, I’m loving the black, kraft and cream card. So striking for a holiday card! Absolutely wonderful stamps and sneak peeks, love ’em all! 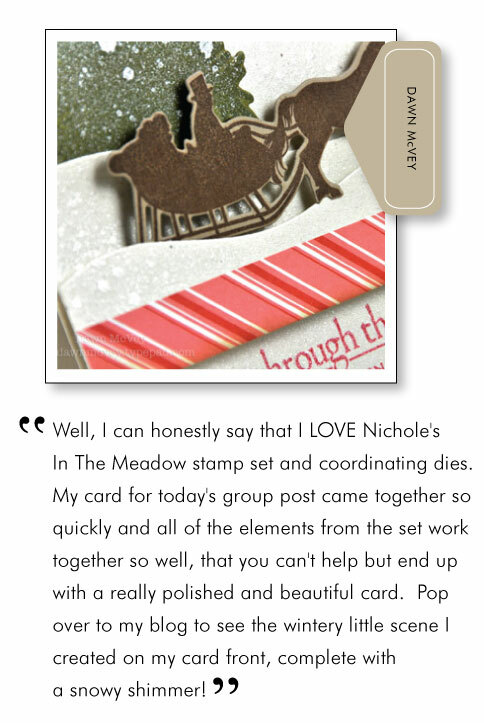 Wow – I LOVE LOVE LOVE the In the Meadow set and the matching dies – they are just SO great! I love creating scenes and this will make it so easy and fun! Love the silhouettes! And that front and center die is really neat – can’t wait to try it!!! Love the silhouette stamps. Perfect for quick but beautiful Christmas cards. What an amazing concept! Such a cool stamp set and dies and I LOVE the new front and center die! So neat! Did I say WOW yesterday? I am sure I did, but if not, WOW! The cards are amazing, and I LOVE them but that Front & Center die might be the most clever item you have given us, and that is saying a LOT! wow wow wow!!! More amazing samples!!! LOVE the front & center die!!!! In The Meadow is another must have set! What’s a girl to do? Such beautiful cards in todays postings. Just a beautiful holiday collection. The dies are outstanding! I love the front and center die and the vintage feel of the other dies. Oh my gosh, I can’t even find the words to tell you how much I LOVE The Meadow set and the dies!!!! I am glad I did not start my Christmas cards yet. I also love the die for the gift bag. Wow…love the set and dies, and all of the projects. So adorable with all different styles. Love them. Here’s hoping your random number picks towards the bottom of the pile! Ohhhh, I’m loving the new dies!! You always come up with the best stuff!! Love, love, love the In The Meadow dies…so useful year around for various gift bags and different kinds of hills or mounds of snow, sand dunes, grass, dirt, etc., etc. The images and die set are beautiful as well and I really like the sentiments! Now I’m dreaming of a white Christmas…. Ok, I guess my comment didn’t post. I’m loving the new dies!! You always come out with the best stuff!! I am head over heels in love with all these stamps and dies. I cannot wait. It is everything I love about winter and Christmas. In the Meadow is such an adorable set, and the coordinating dies really push it over the top! 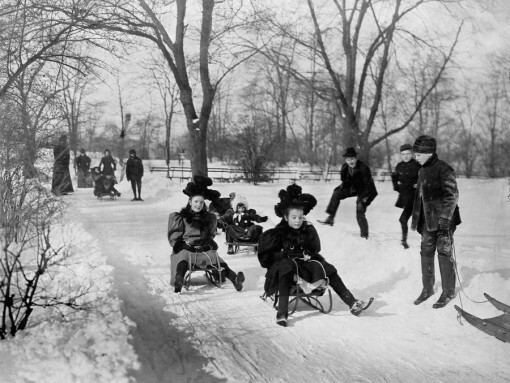 Such great images in this set, my favorite is the small child on the sled. I love all the projects that you and the DT have shared with us…as usual, very cleaver and talented bunch. WOW! Powerhouse release today! I love the “Front and Center” die! So many ideas are spinning around in my mind! In the Meadow is a wonderful set; nostalgic feel and outdoors-y! Love it! Since I grew up in the tropics, where the lowest temperature was about 75 degrees, I’m a complete sucker for any winter sleigh image. This set is definitely a must-have for me! Thanks for the chance to win it, and thanks for all the inspiration today! What beautiful sentiments! I’m in love! You always have the most amazing stamps and dies! This winter collection is my favorite because it is my favorite time of year! I love every die from this release! You’ve done it again! The ideas and inspiration included today have me adding all these items to my wishlist! What a great set! I’m really excited about this one! Great set for anyone to use for winter cards! So beautiful and nostalgic! The images remind me of old book illustrations. In the Meadow looks just beautiful!!! I adore your card! The popped die cuts bring it to life!! My head is spinning! Everything is so beautiful and unique and amazing!! During one of the podcasts, I remember Nichole saying she would love to hear fresh new ideas for Holiday sets. I think she nailed it with In the Meadow. It is unlike anything I have in my collection and anything I have seen in store or other companies. I love it, the images can be stamped or just diecut which leaves it open for so many different possibilities. Can you tell I can’t wait for it? Awesome release!!! I can;t wait for tomorrow!!! I love silhouettes, so the whole meadow collection looks great. The bag die looks fun for packaging goodies year round. I just adore these new dies, and the DT samples are fantastic! Thanks for the opportunity to win! These are more great stamps. I really love the new dies. What a cute way to make your own gift bag!! Today projects are stunning. Love the silouhettes and the dies. Boiy do I love Front and Center. So helpful all year around. Thanks for sharing and the chance to win! I love all the products and cards today. I could be very happy to win these! The paper bag upgrade die is genius! I have been trying now to spend any money this fall, but I can see my resolve waivering with this product! Ok, so I thought I wouldn’t be spending much on this release but was I ever WRONG. 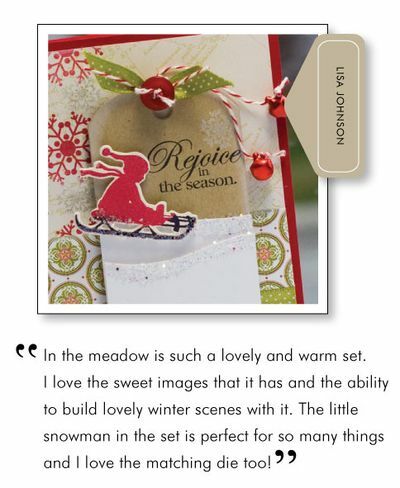 The Meadow set is a must have because it can be used for much more than Christmas cards. My husband and son are deer hunters so their birthday cards next year will have deer on them along with trees. I can’t wait to get this set. Love the vintage look. The designs from each team member are terrific. Every month I am stunned and can’t wait to try out my take on the designs. Love it! I love the vintage silhouette look to the dies. The deer really caught my eye because I want to use those for some masculine cards – not necessarily just for Christmas cards. What a crazy busy week for me…Just got to look at the new sets coming out and WOW!!! !what fun! especially today’s In the Meadow! I love that little sledder….reminds me of when I was a kid sledding down the hill on a ‘real’ sled! You have done it again Nichole…simply AMAZING! Have fun tomorrow night – I will be traveling and once again will miss the festivities! What a vast amount of talent you ladies have! Really enjoy seeing the same stamp set used in a multitude of creative ways. Reminds me that there are many things I can do with only one stamp set! Thank you! love this Christmas release – can’t wait to begin making my cards for the holidays. Can I just saw wow?! Really, these are amazing as are the samples. The bag die is unique – what a fabulous idea! In the meadow is such a lovely collection. Can’t wait! Love the front and center die! I can’t come up with words for todays release. In The Meadow (WITH DIES) just blows me away and then to add the Front and Center Die – Wow, everything has been said. These are awesome!!! So beautiful! I love silhouettes! And the matching dies will make crafting super fast and easy! What a wonderful new set. Love all the classic Christmas and winter images. I’m loving all teh new dies too! The possibilites are endless with PTI. Wow!!! This is my first time to your blog and the creations with your stamps are amazing. I will definitely be making an order when this release comes out. Love the horse and sleigh and the snowdrifts, and the gift bag, and everything. I just love these images that celebrate winter! I am thrilled with the Front and Center die and your gift bag is spectacular! Looking at the In the Meadow stamp set & coordinating dies makes me feel like I’ve been transported back in time. What a wonderful set. I love all the new dies!! So many fun applications!! I am simply amazed. The stamp set is sooo beautiful. Nichole you thought of everything, as usual. LOVE! And the Front and Center die…cannot stop looking at the samples. Stellar month…WOW! Wow, these are dies and stamps are great! I think I want everything that is coming out this month. The cards are just wonderful. Can’t wait until tomorrow night for the big reveal of it all. Love it all! This is my favorite Christmas release ever!! I love In the Meadow stamps and dies. Such an old fashioned setting. Wow! I love all the projects from today. I’m really getting into the Christmas spirit and it’s not even Halloween yet! I love this set, especially the dies. I knew I’d like the pine tree, but the kid on the sled is great. Lots of ideas percolating with this one. Excellent die and stamp sets! Can’t wait to try them out! Oh wowza wowza! This is an adorable collection. I want all the coordinating pieces. This is a snapshot of our winters. Absolutely wonderful. Love this set! You did a great job on the dashing through the snow card. I love your snow-covered hills and the fact that you used the musical notes as the background – what a great idea!! And great inspiration for us as well, thank you. OH WHAT FUN IT IS TO RIDE ON A ONE HORSE OPEN SLEIGH! LOVE IT PTI, YOU HAVE OUTDONE YOURSELVES AGAIN!!! The silhouettes are beautiful. They have such a classic, vintage feel to them. I love the DT projects, too. Can’t wait to see this set at reveal. I really like the Front & Center dies. Perfection! I like they can be used year-round for any occasion, not just Christmas. Betsy stole my heart today. Goodness gracious, I love her ideas! Oh, PLEASE PLEASE PLEASE choose me!!! I absolutely love everything in this prize package. You are amazing! Amazing dies! Love them all. When I saw the sneak peek of this set, I thought…it’s not for me. Now that I see what everyone did with it, I am so in love! It truly does make beautiful timeless cards with images that we all associate with winter and the holiday season. Love it! Literally, I’m sitting here thinking “Oh…Nichole…Oh…wow.” I mean, I’m totally blown away!!! In the meadow silhouettes looks very fun! I look forward to it’s release. Thanks! I love the In the Meadow stamps and dies! The new dies are amazing! I want them all!!! this makes me really want to get started creating holiday cards. love this set. Love the silhouette theme. The dies make this set even more useful This entire month’s release is amazing. I’m excited to begin my Christmas cards. Oh my I love all these dies. Love, Love, Love all of todays projects. Love the dies, the stamps, everything. Thanks for another wonderful release and can’t wait for many more. I love to decorate gift bags and you have totally made my day with the dies for bags! I am beyond excited. You totally amaze me with your dies and matching stamp sets! Love the new dies and the In the Meadow set. Thanks!! I think I’m most excited about the dies!! finally I can get some to look right! Oh my goodness I love the In The Meadow set and dies!!!! This is a fantastic set. The new products just get better and better. It is going to be a hard month for the old budget! wow! the in the meadow stamp set and all the coordinating dies look like they would be so much fun to work with! today’s post was filled with so many great projects. as always, thanks for all the inspiration and creativity! These winter sets are amazing. I love to build little scenes. They look like so much fun! Love this set! The dies will make it so much easier for me to use also. Thank you for such amazing inspiration. I really, really love the Front & Center Die…….can hardly wait to order it! All the inspirational ideas this month have been awesome….really puts me in the mood to start crafting for the holidays! Such inspiration today!! Great set and I love the dies. Thank you for continuing to bring us such wonderful products! Riding in a horse drawn sleigh in the snow is on my “bucket list”–(not living where that’s a possibility)–so I’ll do it vicariously with this set! The images and sentiments in In the Meadow do such an amazing job of capturing symbols representative of the spirit of Christmas! WOW!!!! Amazing “in the meadow” dies and matching stamps! I am totally in love with them, and I am in awe of all the amazing projects made by everyone in the design team. This is a must have set for me. Thanks for a chance to win! I can’t fathom the releases getting any better because they’re always so awesome. But you guys do it everytime!! Love the gift bag die and In the Meadow collection, and EVERYTHING else!!! I love the new stamps and dies! I can’t wait until the 15th! Charge! In the Meadow is such a such a well thought out ensemble of creativity – the images can be used for so much more than Christmas. Superb. Love. It. All.! Love all the stamps & dies!!! Everything is just so beautiful. Thanks for the chance to win! I love the “Meadow” die. How versatile! The snowflakes are so cute. I’m loving the Front and center die (gift bags are my thing!!) and I love the meadow motifs and dies!! So fun and that wonderful vintage feeling. thanks for the chance to win these wonderful products!! That gift bag is amazing! I’ve got to get that die! All the layers and details are incredible! Thanx for always inspiring me so much! The gift bag is trully beautiful, the new Front & Center die is a must! This collection and the dies looks just amazing! Everyone’s projects are wonderful. I especially love the sentiments I have seen so far, and the front & center die, . . . actually I love it all! This set instantly reminded me of some of my favorite Currier & Ives Christmas prints. I know I absolutely need to create with it! OH MY WOW! This is so cool. Love all teh options. 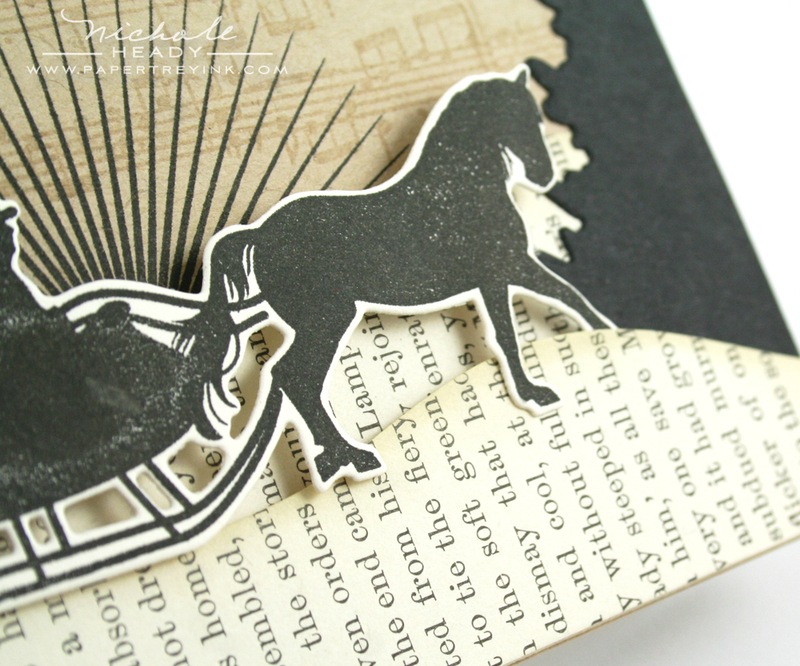 So many great ideas with this wonderful vintage looking stamp and die set. I love the new dies for building a scene as well as the snowdrift dies. These would be great for cards all winter long! Love that front and center die for sprucing up lunch bags! I am in love with this set! The dies, the silhouettes, the sentiments. It just brings to life winters as a child. So wonderful. The new die for decorating paper bags is a great idea as well. Just in love with everything! Wow…the new stamp sets and dies today are incredible! I love the DT take on the sets and how creative they were! Inspiration is pulsing through my veins:) Pure awesomeness!